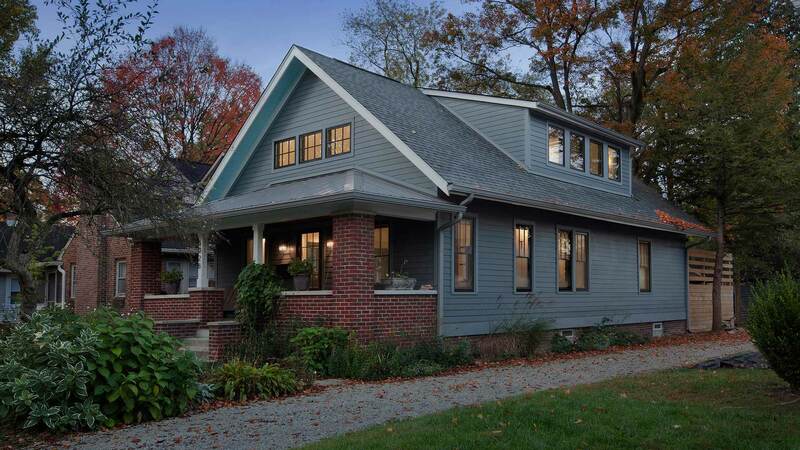 We met our Broad Ripple Modern Craftsman clients at the Broad Ripple Home Tour in Fall 2014 when they were volunteer docents for our Broad Ripple Bungalow project, which was one of the homes on the tour. 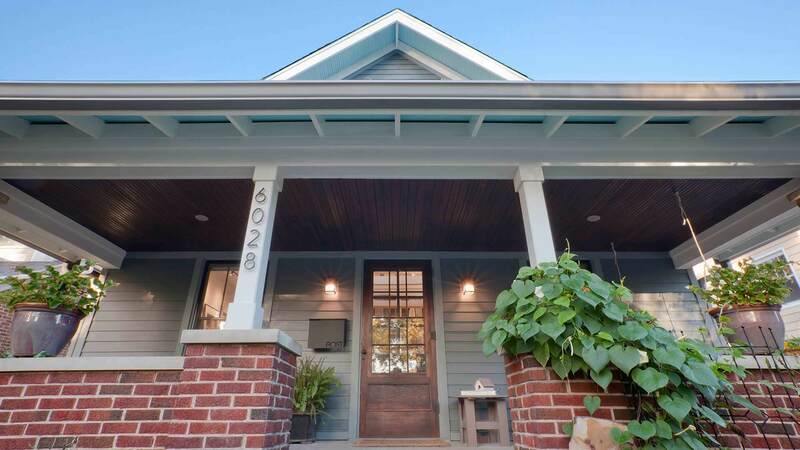 By all means, we were very happy when they called to begin the planning process for their craftsman-style bungalow also on Carrollton, a beautiful, walkable street lined with several excellent Craftsman-Style homes. 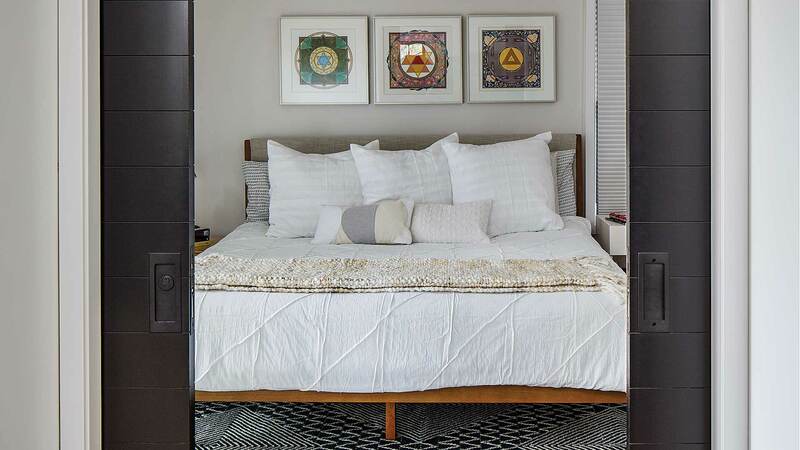 Having lived in the home for 20+ years, our clients didn’t want to leave but wanted a respectfully-modern, light-filled transformation to support their lifestyle for the next 20 and beyond. 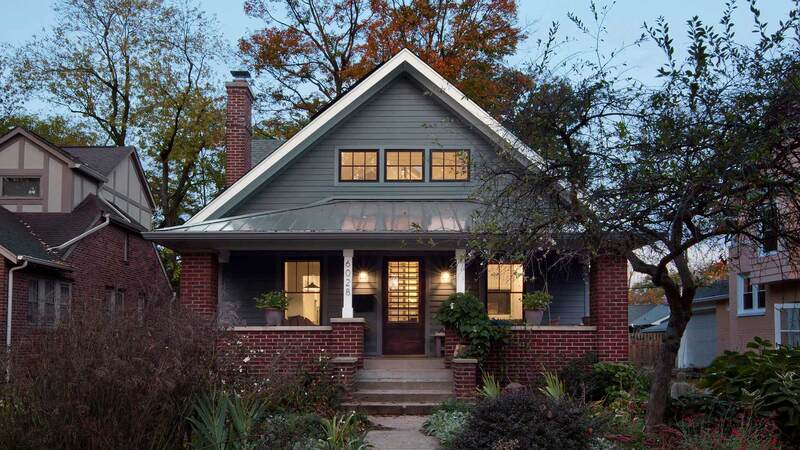 The new design reflects their personalities and life-stories (who they are and how they want to live) on the inside, while the outside is a major upgrade dialing-up the Craftsman style. 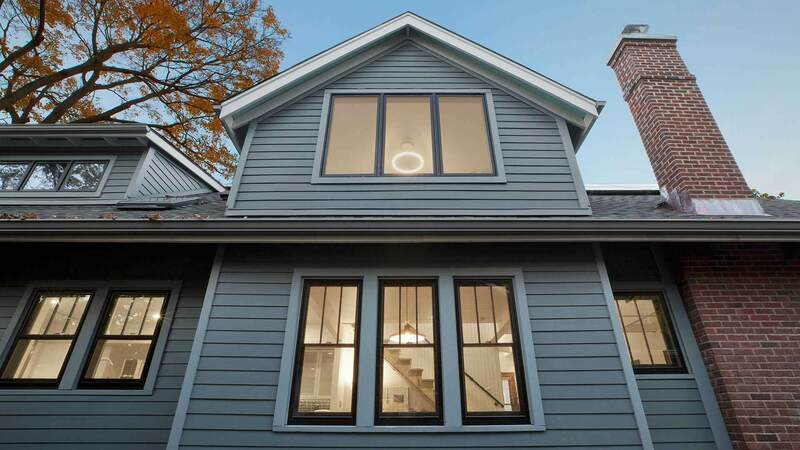 Since our clients are passionate about good design, high-quality materials, and energy/resource efficiency, this project was a perfect fit for an architect-led design-build approach. Certainly, we enjoy the design process, but also collaborating with the trade contractors and overseeing the construction. Undeniably, a direct conduit from design to construction helps ensure the successful implementation of design vision. We began construction in September 2016, substantially completing it in April 2018 as planned (7 months). Check-out the time-lapse video below. Paul Reynolds and Derek Mills fabricated and installed the steel guardrail prior. Then later, they came back to install the vertical stainless-steel cable-rail system. If only it could go this quickly in real-life! 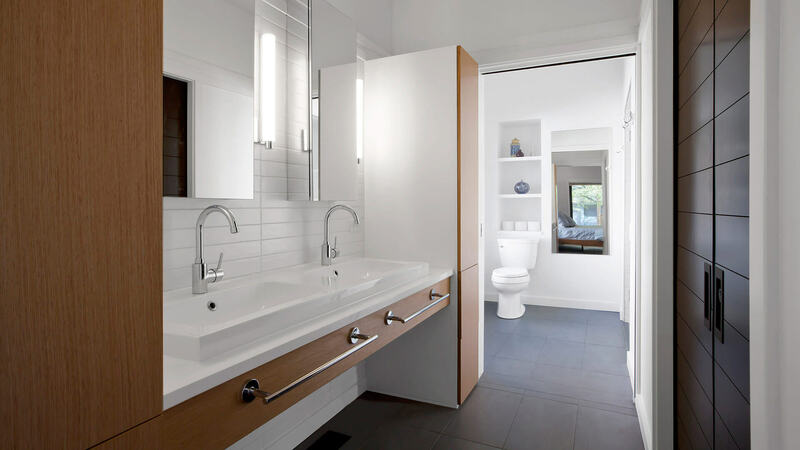 The design modifications included in this complete gut/remodel include new everything + personal touches inspired by the owners. Exposed structure + connection hardware is a nod to Lori’s father, who worked in the building industry designing hardware. 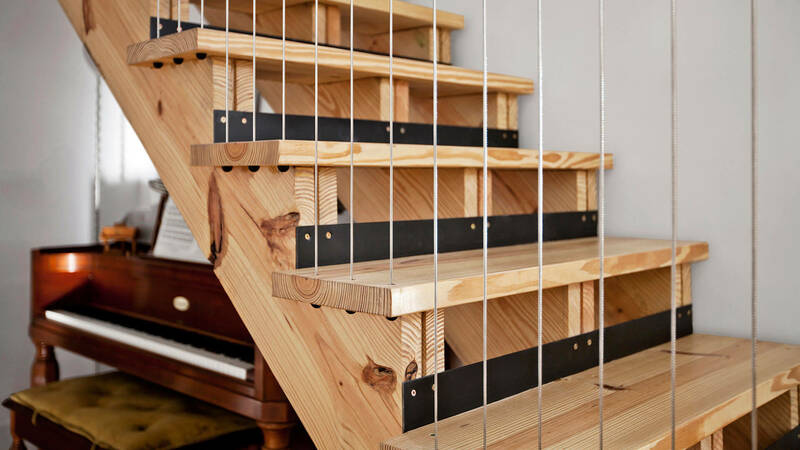 Also, other interior details that pay homage to client interest in music, particularly stringed instruments. We will share more of the story and design process, including interior design concepts and renderings, as the project progresses. The interiors are what really sets this project apart. It is important to think about the big picture but also the details. 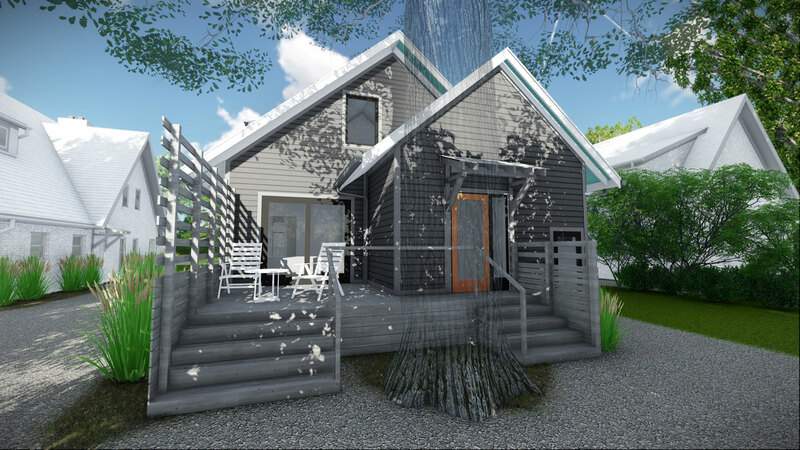 At HAUS, first we work to establish the big-picture concepts, which are inspired by our client and particulars of place. From there every subsequent decision is born from that concept. Certainly, our clients are our inspiration, and therefore, they have ownership if not just the physical home but also the design solutions. Their personalities ARE the design. 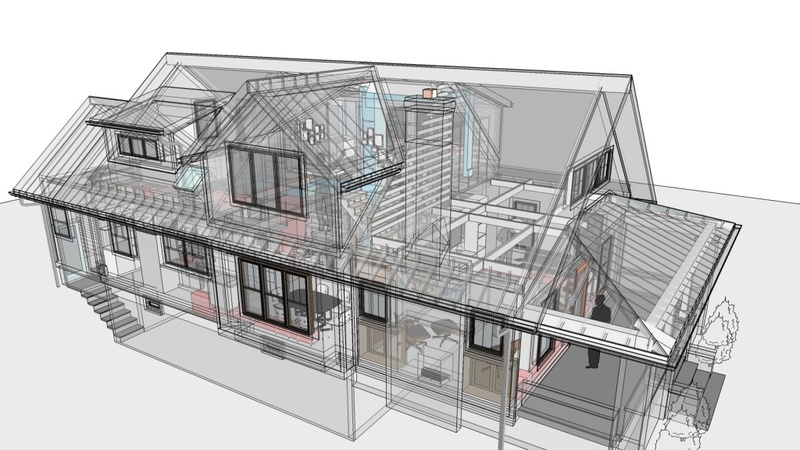 Although the construction documents are two-dimensional, we think, see, and live in three dimensions. The image below is a ghosted version of the 3D computer model. As can be seen, this model includes developed details, so this was near the end of the design process. One can begin to see all the elements within the spaces, from the structural elements to the furniture pieces. Please check back later as we’ll share more about the beginning of the design process before it was this far along! 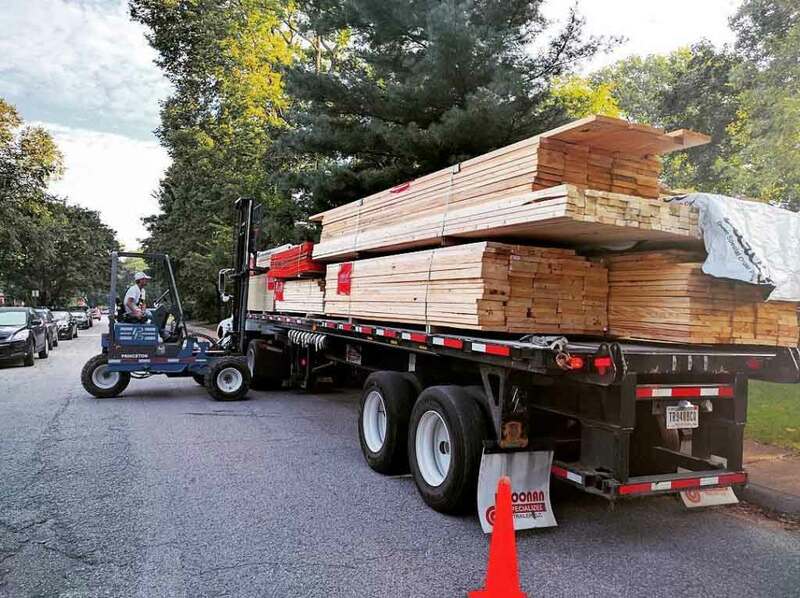 Here’s a shot of the existing house as lumber began arriving. Our client refers to existing roof eaves as a raccoon motel. This is because they are in disrepair with gaps allowing wildlife to camp-out. 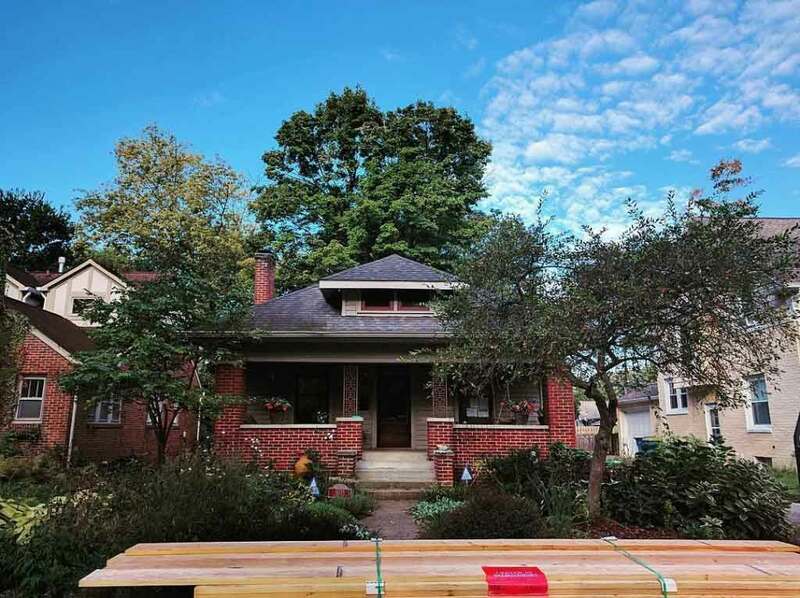 We will be bringing this bungalow above and beyond its original Craftsman roots from a design, detail, and quality standpoint. This preexisting roof and attic space is coming off to accommodate the new upstairs. Framing lumber arrived in mostly one delivery, which was helpful. This is because the site is unique in that it shares a driveway with the neighboring property and much of the landscaping is to remain. We managed to tuck the lumber package back into the owner’s carport and driveway, which gave us room to set a dumpster next to the house, rather than in the front yard or street. And with a few swings of the hammer, the renovation has begun! We began by salvaging a lot of elements from the existing space. We donated much of the existing light fixtures, plumbing fixtures, and cabinets to Habitat for Humanity for re-use, thus diverting them from going into the dumpster. 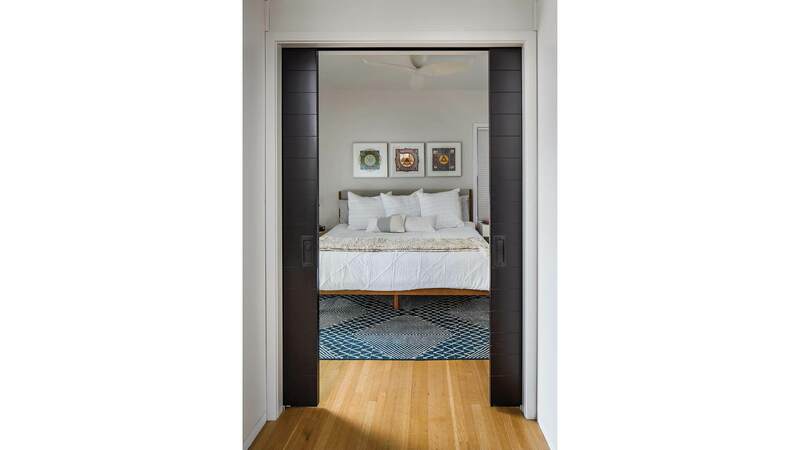 At client request, we salvaged original doors and trims for re-use in the new design. 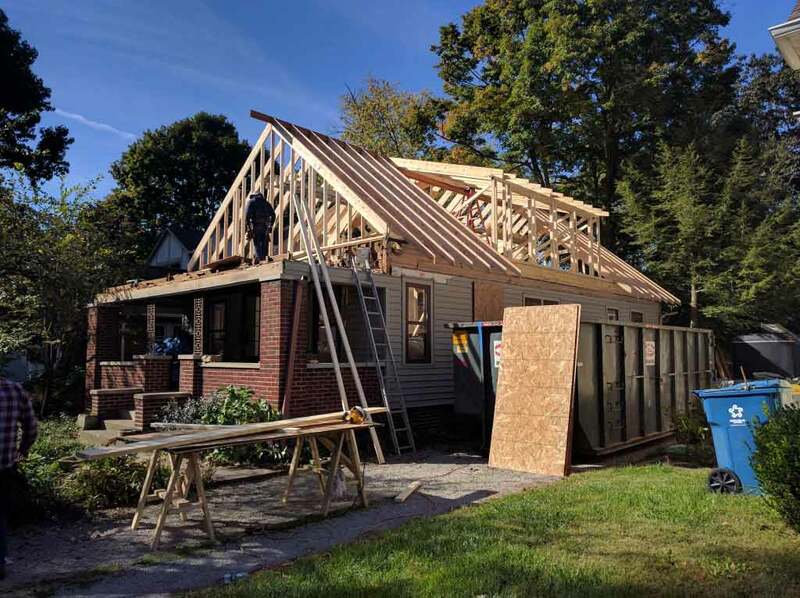 It was not our original intent to completely demolish all interior walls and ceilings, but our framer urged us to consider it since that would streamline the process and give an entirely new interior. Let’s do it. The demolition crew wasted no time with the wonderful Fall weather. The skies were blue and the sun was shining brightly. The weather forecast could not have been any better for the demolition of the existing elements. During the demolition stage, we sorted out several details in order to proceed with new framing. Firstly, the framer let us know that existing exterior walls were not plumb. 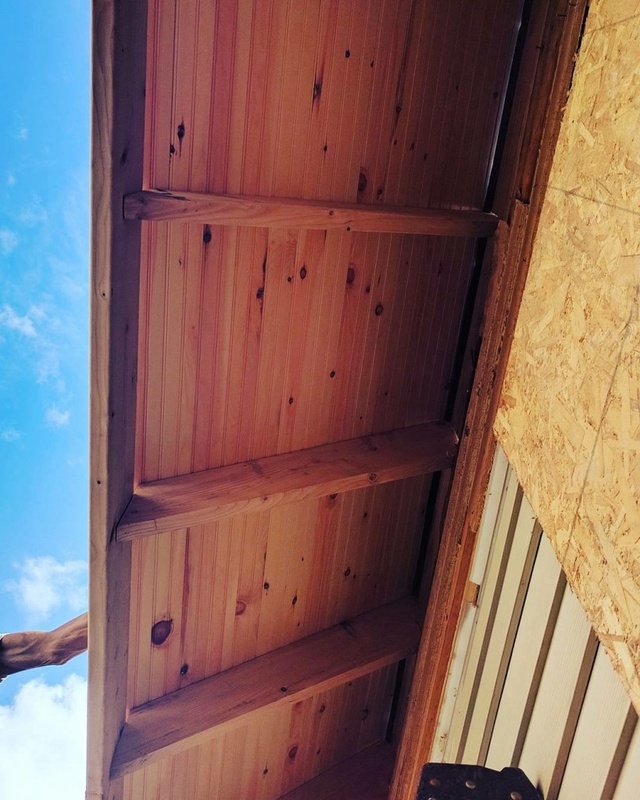 It appeared that original undersized 2×4 roof rafters may have contributed to undue stress on the exterior walls by sagging and pushed outward on the top of the wall. In some areas, top of exterior wall was five inches out of plumb from the bottom of the wall. Before moving forward, we corrected these conditions, and from there, framed the floor structure. 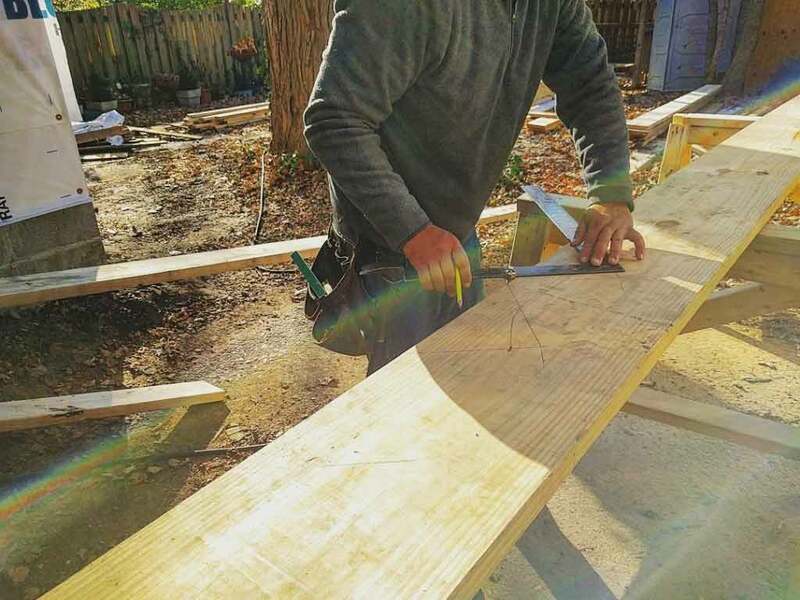 The framers continued to take advantage of the good weather. Two weeks into the demolition and framing, the roof structure was almost complete. The new form of the home was starting to show as the dormers peel up from the main gable. We are enhancing original roof structure with higher pitch and beefier structure. 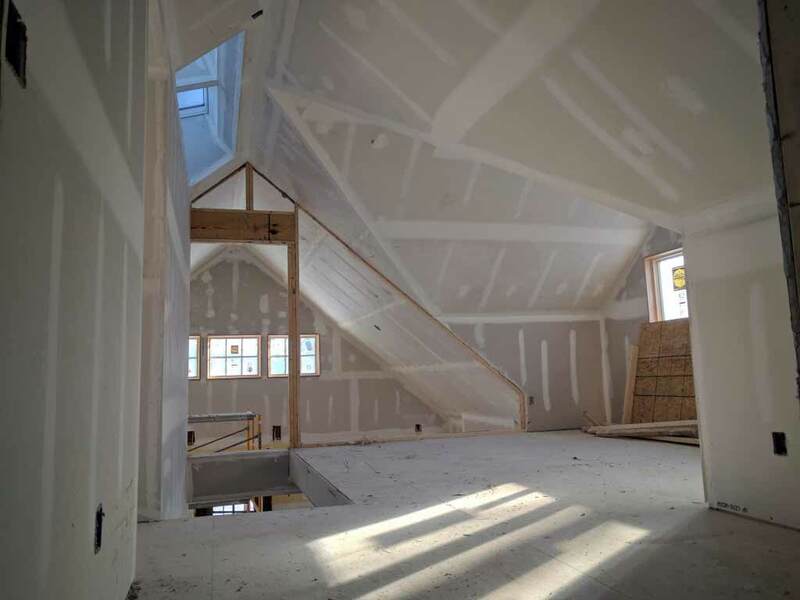 The higher pitched roof and dormers allow the upstairs to have livable space, unlike the dark, low attic space that used to be. As the construction progresses, it’s essential to keep an open line of communication with all parties. Per Charles Eames, “the details are not the details. They make the design”. 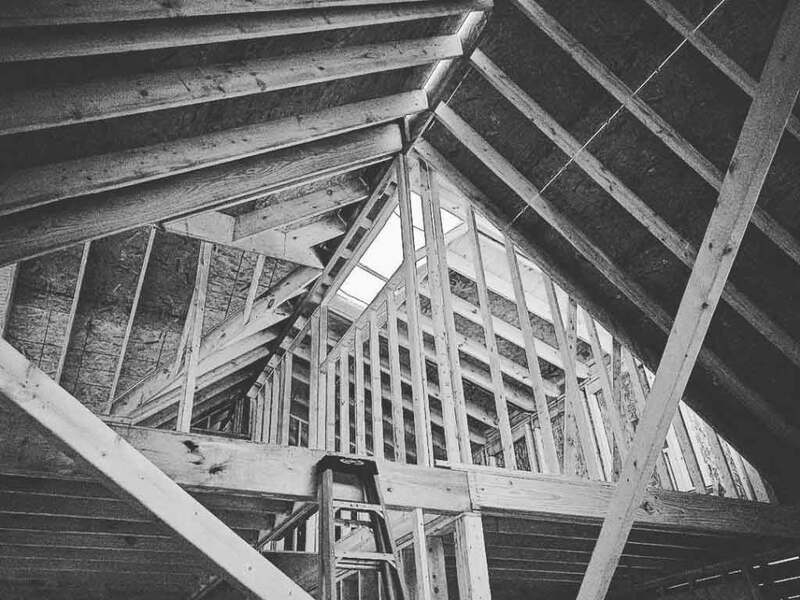 Since the framing gives form to all primary elements, it’s important that all heights, dimensions, and junctures are properly framed. The skeleton gives you a sense of the scale and proportion of the spaces. Below, the structure is standing tall with its neighbors, as stronger, simpler form. 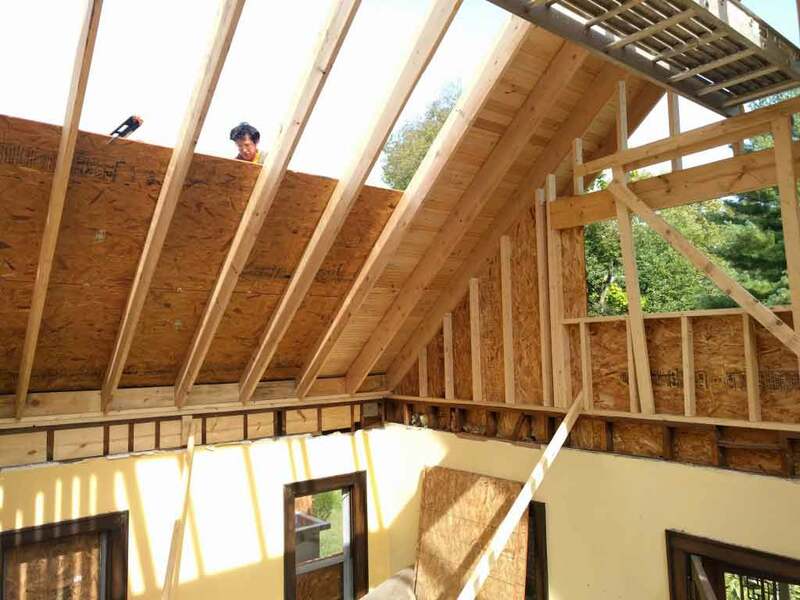 As the framing for the Broad Ripple Modern Craftsman Renovation continues to progress, we start to see some of the details come to life. Here we see framer progress on roof sheathing and window rough openings. 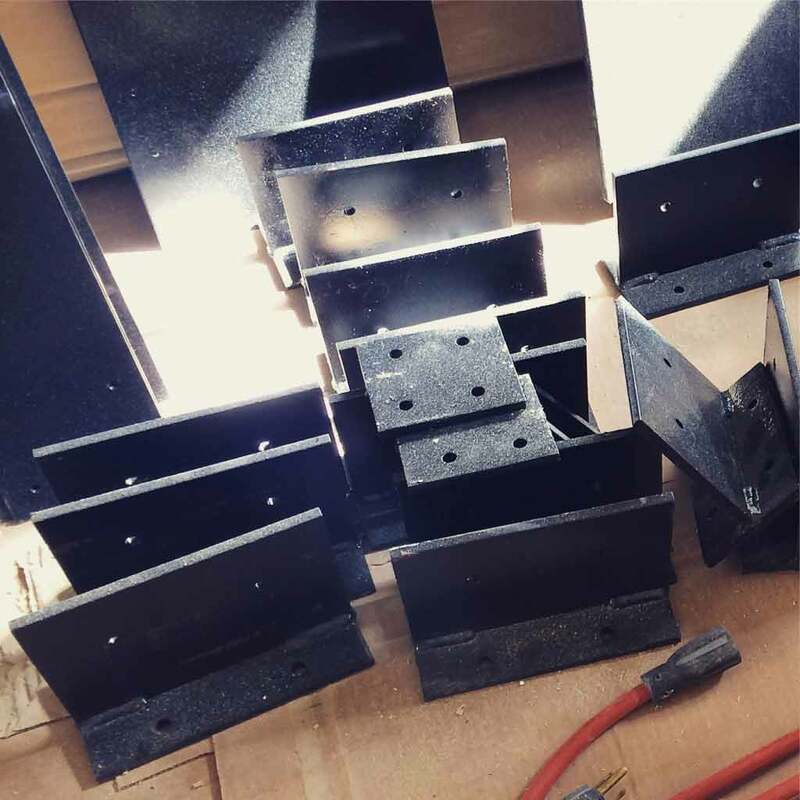 Because we have design exposed rafter tails and eaves, we pay particular attention to installation of exposed bead-board decking and connections. Here’s a shot of the exposed eaves with the tapered rafter tails. Once all bead-board decking and trims are complete, we’ll seal and paint. Condition at eave and wall integrates a continuous vent for roof and rainscreen wall ventilation. We spent a good amount of time considering the eave details for main roof structure, porch, and upper level dormers. 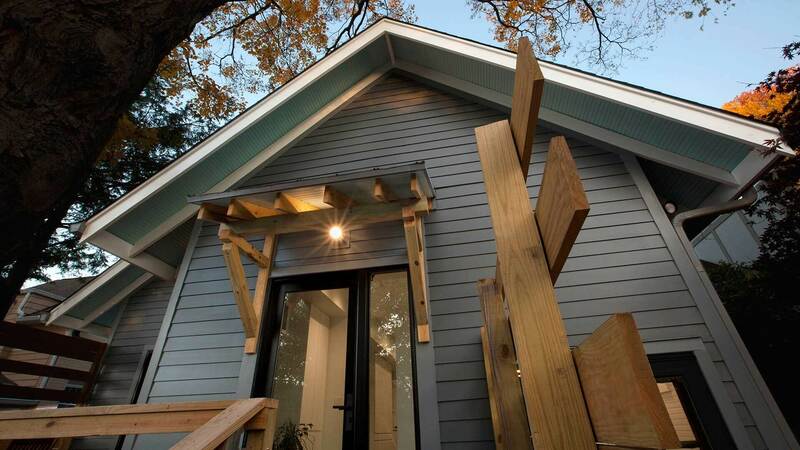 It’s these kinds of details that make-or-break the successful design and realization of Craftsman-style architecture. In the case of this project, we varied overhangs, rafter, and gutter board sizes to be consistent with scale of respective components. 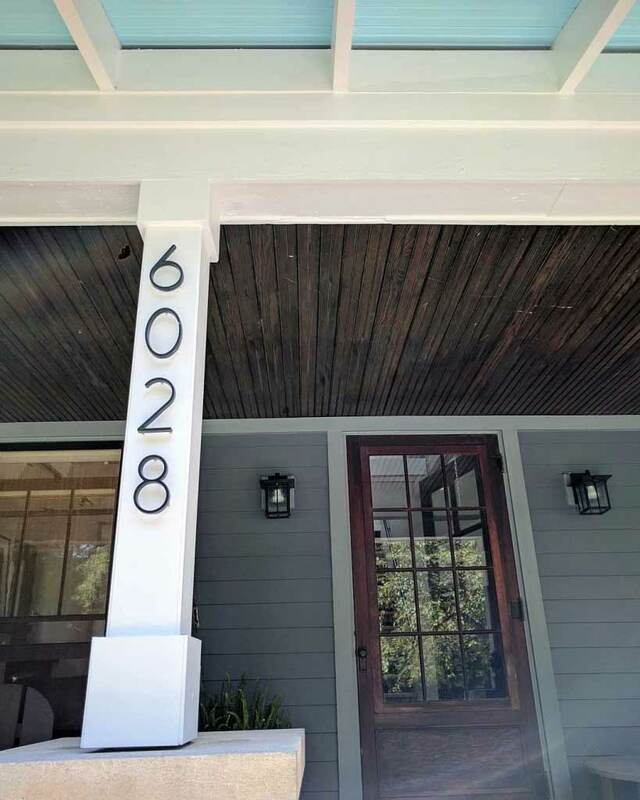 And trips to Seaside, FL helped inspire the tapered rafter tails that we exposed on front porch and main roof eaves. 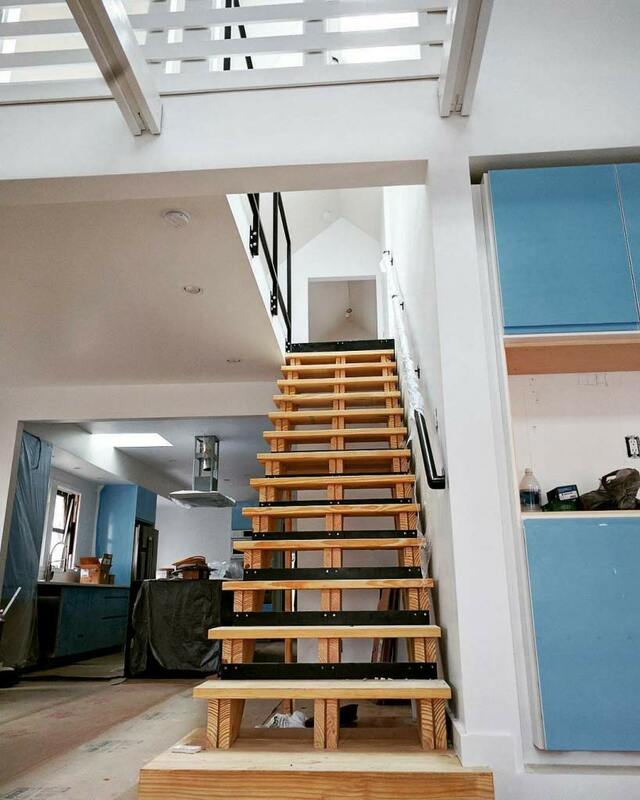 Standing just inside the front door of the Broad Ripple Modern Craftsman Renovation, one can see the volumes of the space starting to take shape. The long skylight at the roof forms a scoop that appears to be funneling light and pouring it into the interior spaces. 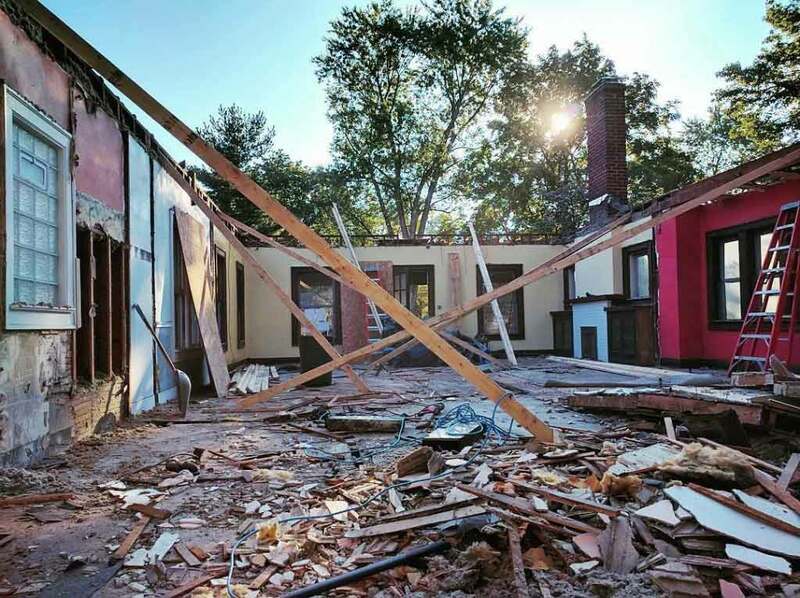 During the demolition process, the owner noted that for the first time once could see the large tree from the front door (through the new skylight). While this wasn’t intentional, it was a nice surprise. Usually the initial framing is relatively fast and exciting to see. Sometimes, we don’t initially catch every detail or notice when something is off. Indicated in the black-and-white photo below, we later noticed that the center wall was located incorrectly and not per plan. It was framed too far to the left on both levels and required a rework. So soon thereafter, framer made it right. Without the adjustment, the space would not have worked as intended. 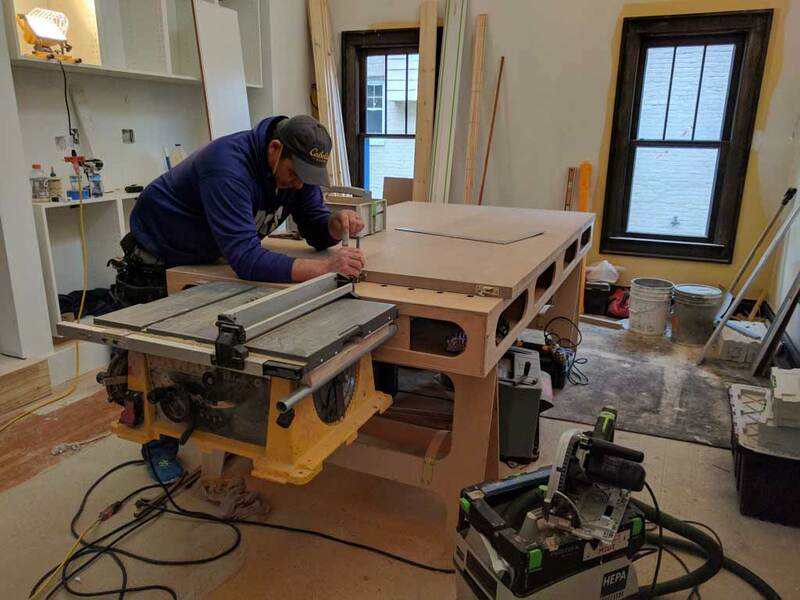 The windows for the Broad Ripple Modern Craftsman Renovation are onsite and ready for installation. 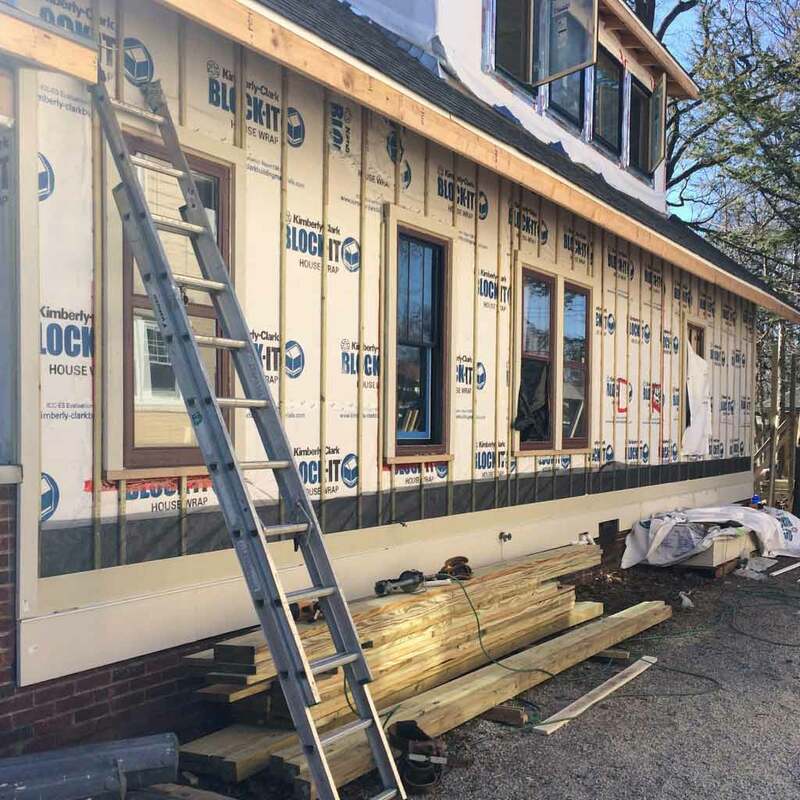 Because the project is utilizing a rain screen wall system, we furred out the windows a depth equal to the rainscreen channels to keep the relation of the window plane to exterior siding consistent. 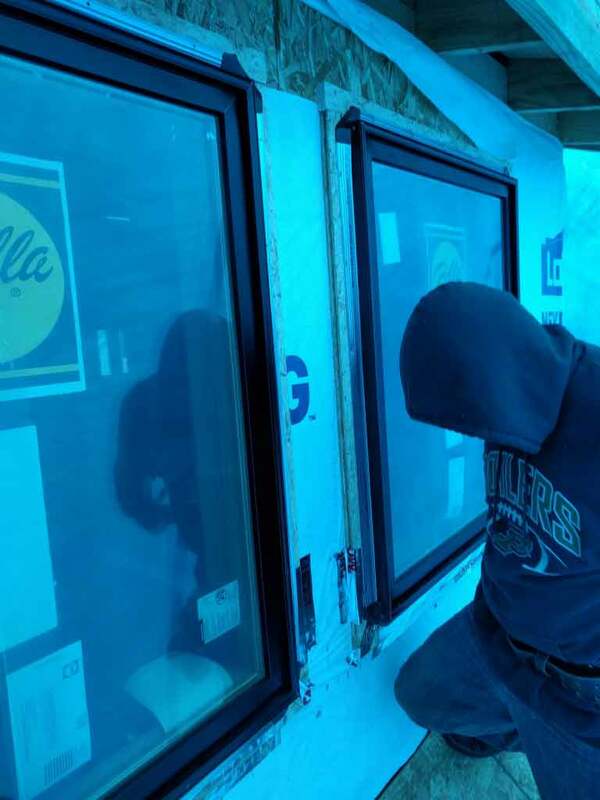 We are sure to be onsite for initial window installation to ensure that all details are correct. The framers were savvy to correct flashing methods, but were open to a few special requests in the process. We decided to set window sill framing at a slight angle, sloping to the exterior, in order to provide another layer of safety. 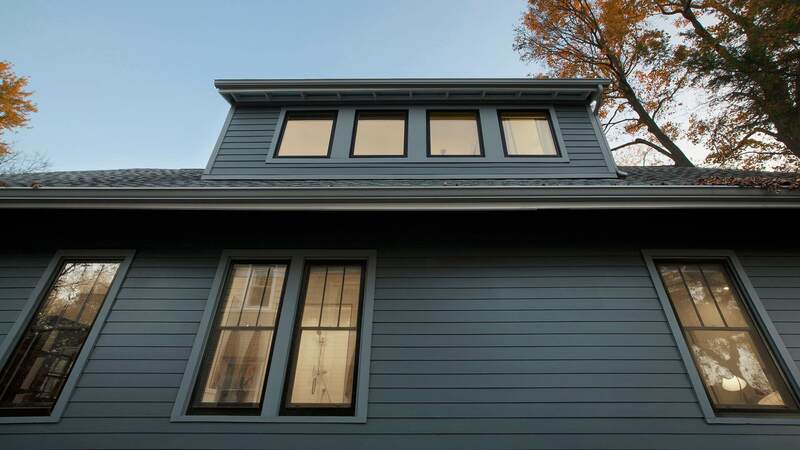 In the event water ever gets into the sill, the water won’t drain to the inside of the house, but instead will flow to the exterior into the rainscreen cavity. 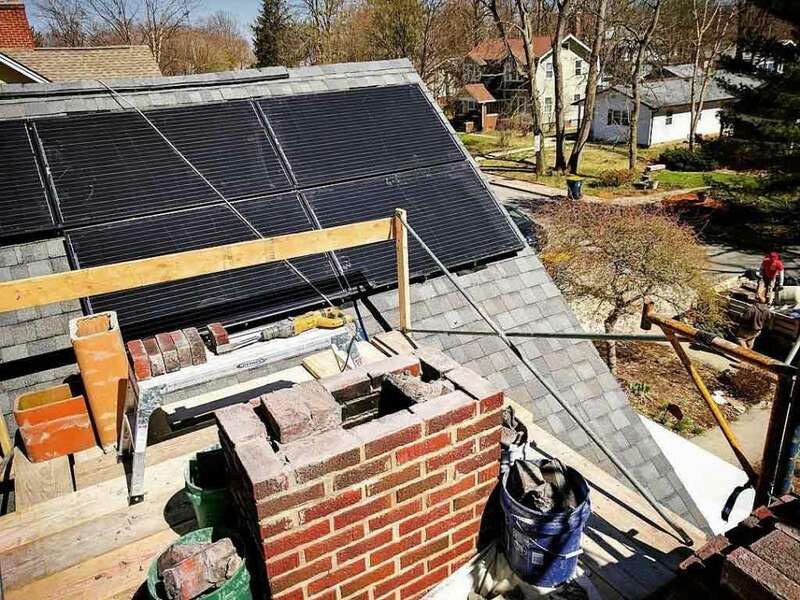 It’s best to dry-in the structure prior to window installation. 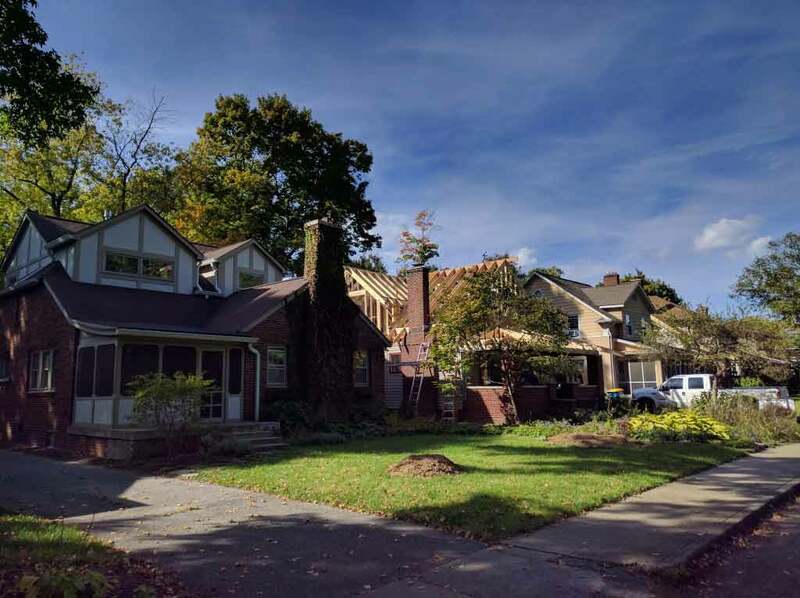 Roofers installed the roofing underlayment for the Broad Ripple Modern Craftsman Renovation over the weekend – it seems everybody these days is quite busy. As a result, contractors are fitting in smaller jobs, like this one, into their schedule by working a Saturday here and there. Also, skylight installations are complete. There are two skylights near the roof peak on the north-facing shed roof and one between the south-facing dormers. The north-facing dormers help balance the interior light reducing glare from predominant exterior windows. In particular, the south-facing skylight allows for the sunlight to pour directly into the kitchen workspace. This creates a more dynamic interior environment as the sunlight change throughout the day. 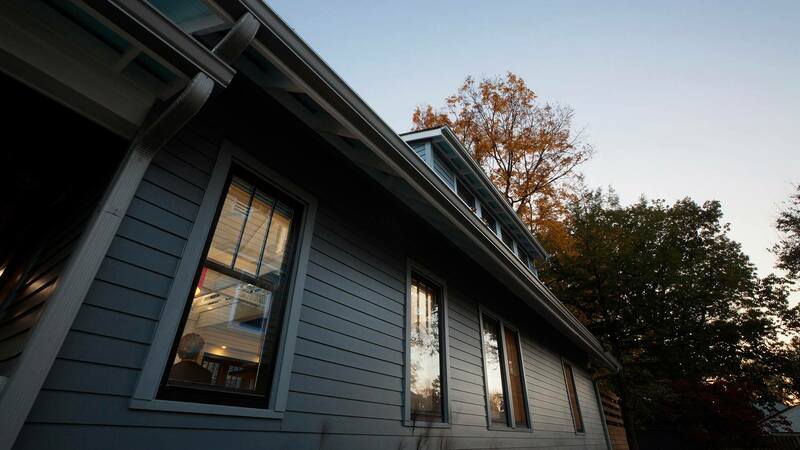 As the seasons change, the trees around the Broad Ripple Modern Craftsman Renovation are turning beautiful colors. This is exciting, but so is witnessing exterior project progress. 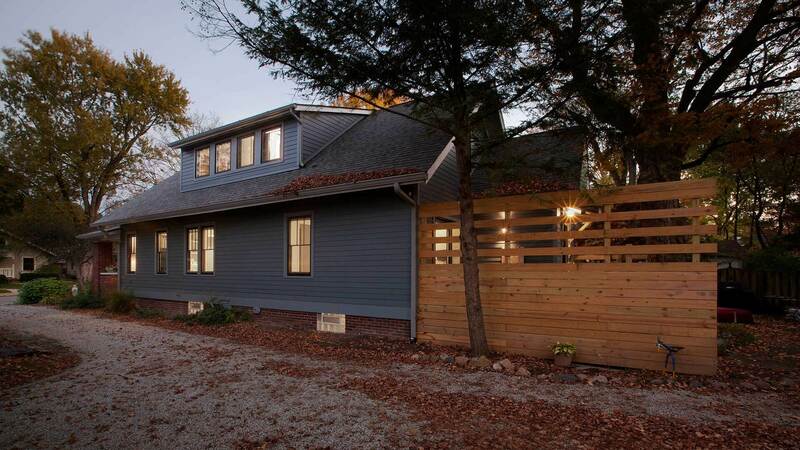 Broad Ripple Modern Craftsman Renovation during the Fall. Teamwork makes the dream work. 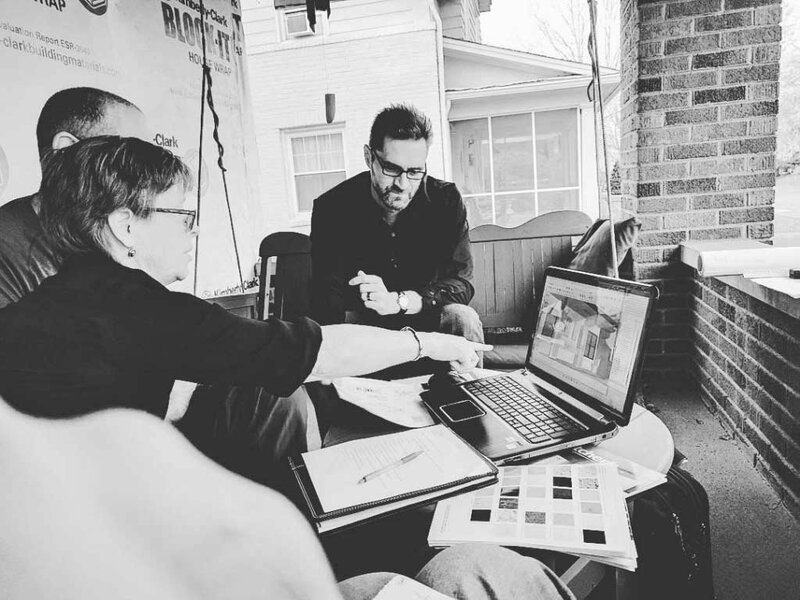 Although we tailor the design process with each client differently, it’s always a collaborative process. For renovation projects, most of the early design process takes place at the property, sometimes both before and during construction. Ideally, we make every design decision up-front. Depending on schedules and budgets, sometimes we are not able to make every decision before construction begins. For this reason, it’s imperative to have the Architect accessible during the construction process to help fine-tune the design. 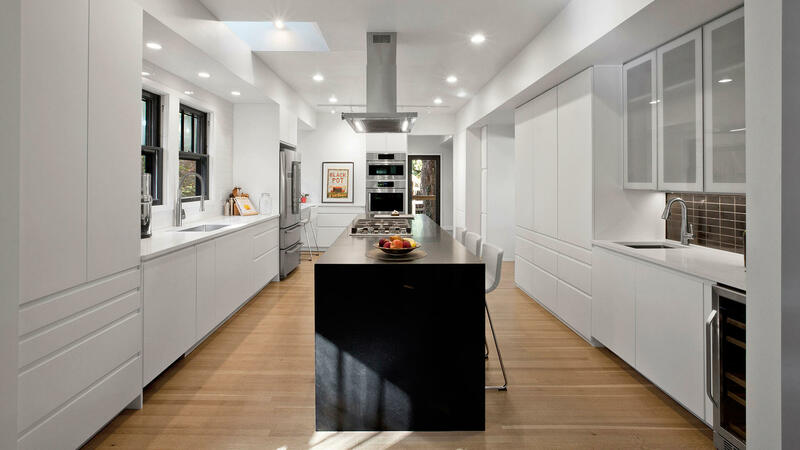 Without a doubt on both renovations and new construction, unforeseen issues come up that need design attention. Although we spend quality time designing with the client, we do the same with the various trades to ensure the details are executed properly. For example, below it was important that framers cut the stair-horses precisely. 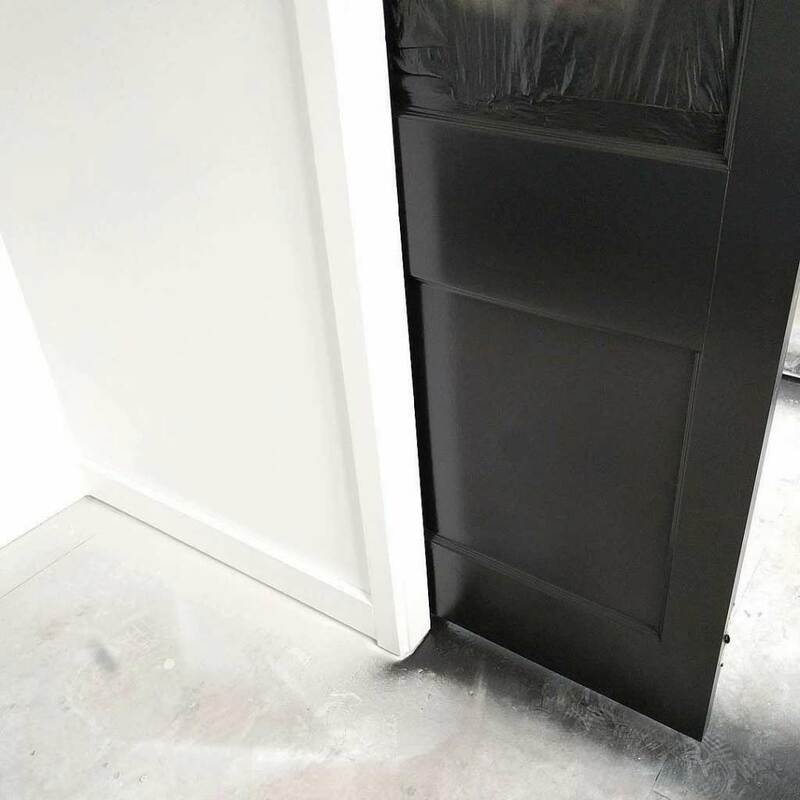 They’ll be exposed, so it is important that their finishing is of the utmost quality, meaning no overcutting at inside corners. We added a few new skylights to bring light into the core. During the design process, we strategically traced the sun’s rays to properly locate the openings. 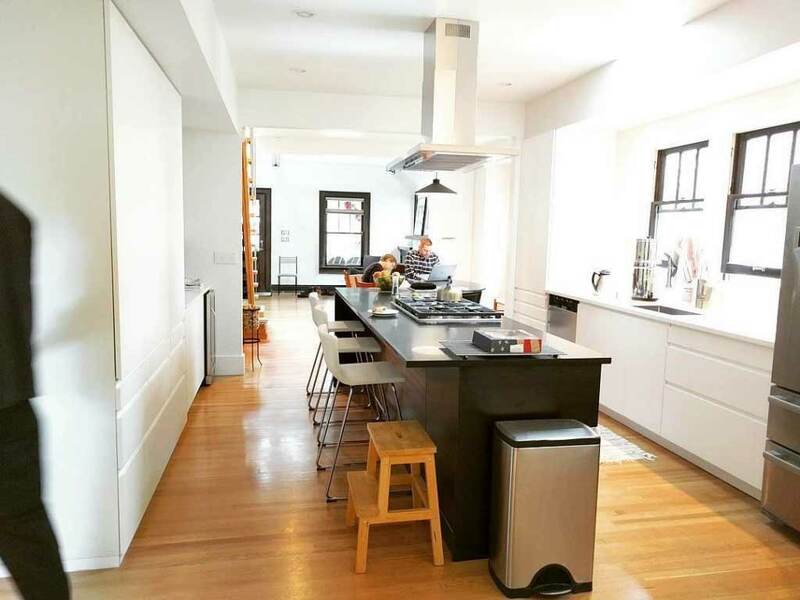 Seen below, the sun pierces through south roof into kitchen over the island. 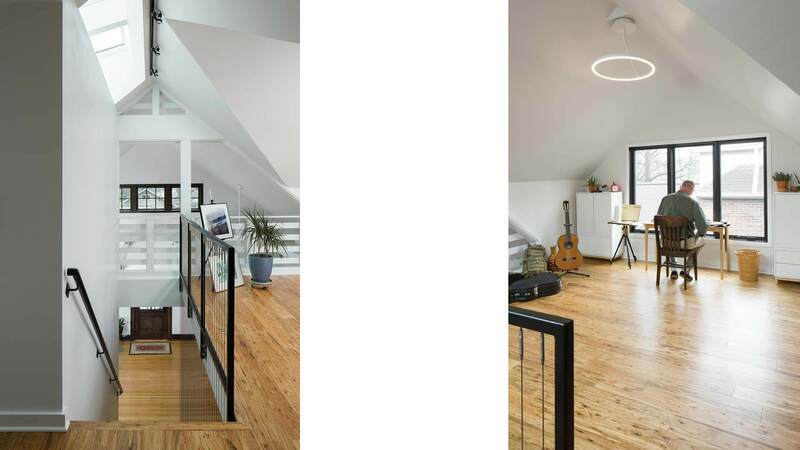 The north-facing stair light shaft (below) enables a more even natural light into upper loft and down stair into main living spaces. 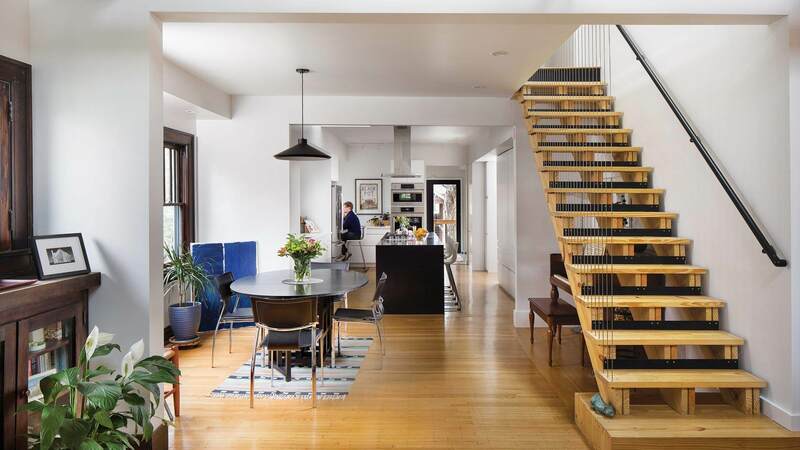 In renovations, you’re at the mercy of what you end up digging up and uncovering. 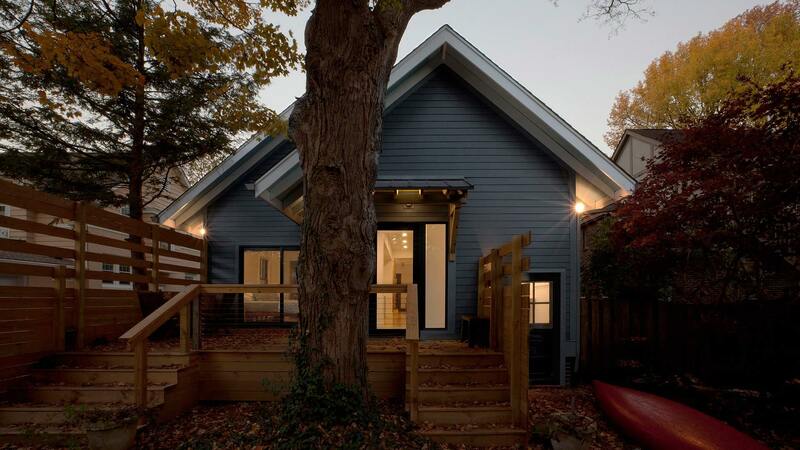 In the Broad Ripple Modern Craftsman, the intent was to re-use a major portion of the existing flooring. 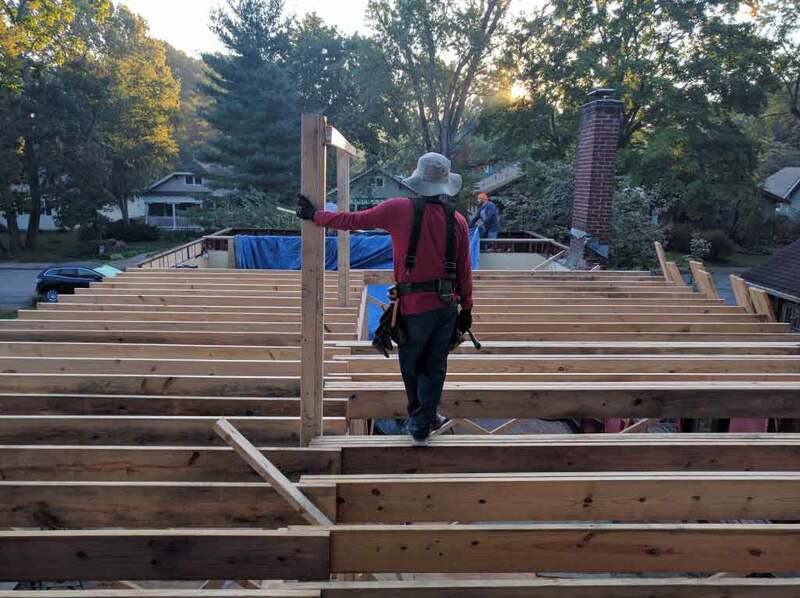 This didn’t go quite as planned as the heart pine subfloor wasn’t in perfect condition – although mostly good – and it was also a different thickness than the existing top-nail oak. 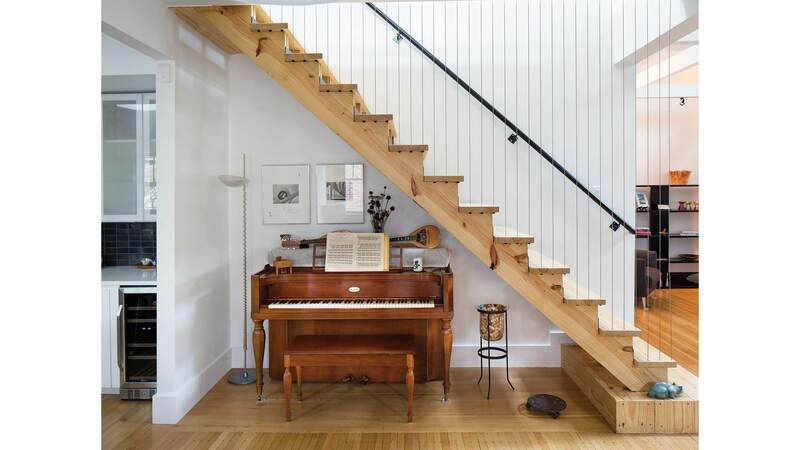 No sweat, we can transition between the different flooring types… or can we? The kitchen floor threw a wrench into that plan. We could have predicted this. We really just needed to demo and completely redo the subfloor and finish flooring in this area. The image below shows the original patchwork. 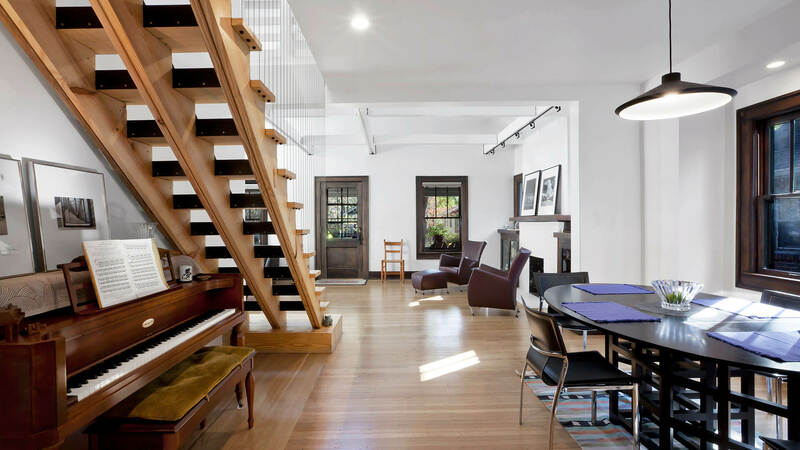 The mix of materials here doesn’t make it easy to install new top-nail oak flooring. We worked closely with the flooring contractor here to ensure the solution wouldn’t take the budget and run. 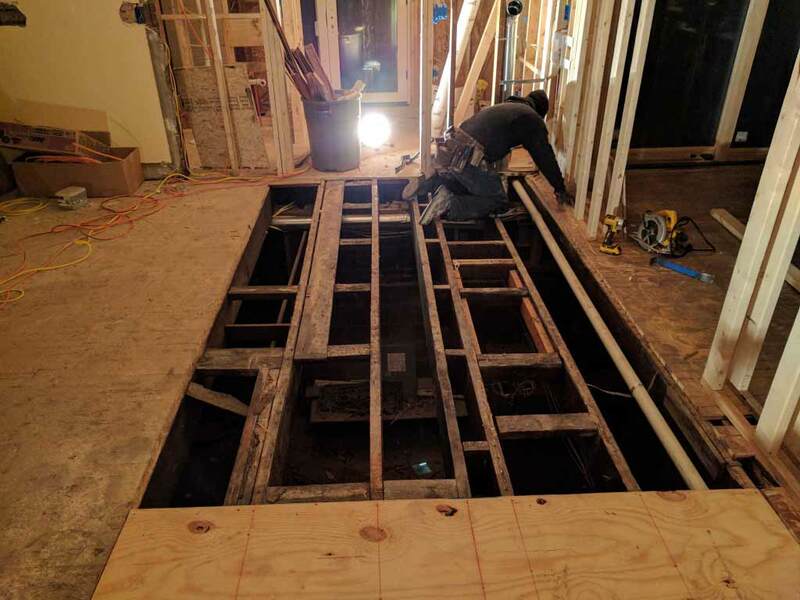 By working with the contractor and the owners closely, we decided the best route to continue forward was to replace a portion of the jigsaw puzzle. In doing so, we were able to ensure a proper substrate for new finish flooring. Let’s cut it up! Winter is here and the temperatures are starting to slide. Fortunately, we’re ready to fill the wall and ceiling cavities with insulation. To achieve an excellent insulation value in the ceiling cavities, we’re going to go with a blown-in, dense-pack cellulose. For those interested in numbers, the theoretical R-value of the ceiling cavity is R-46. For the walls, we also went with a blown-in cellulose. As one can see here, we moved the window location in the Master Bedroom to support the new design layout. 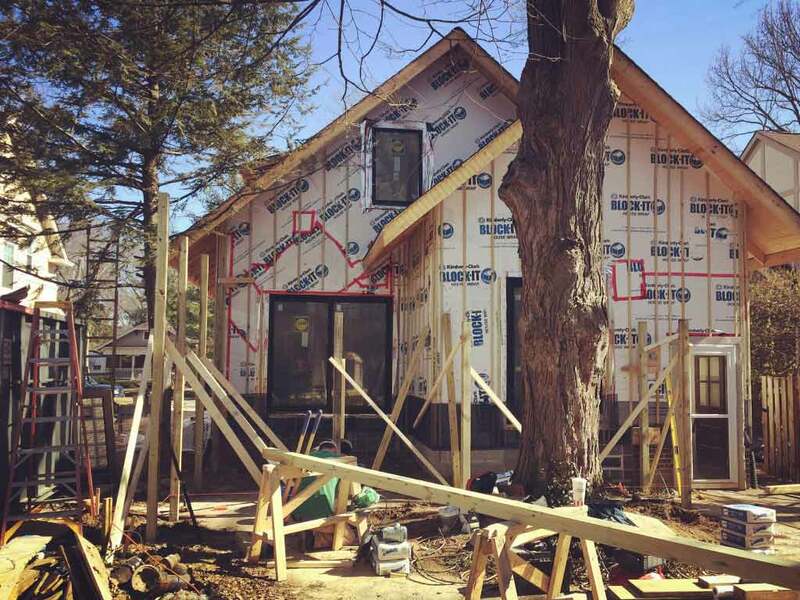 For this project we have not installed CI-continuous insulation outside exterior sheathing. However, CI is the best way to avoid losing energy at stud locations and now considered a common “best practice”. Time for things to get a little messy. One should only blow insulation while wearing proper PPE! 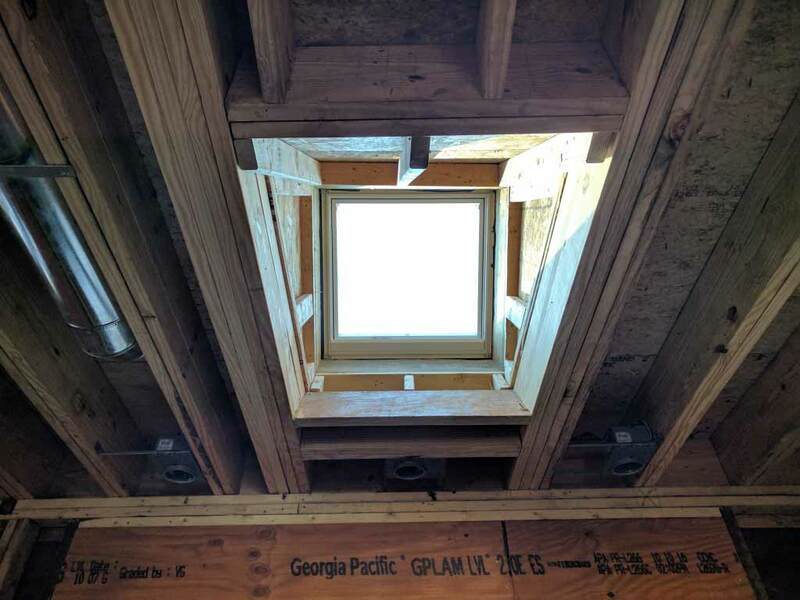 Because the ceiling framing was 24″ on center and the cavity was almost 13″ deep, we weren’t able to install the dense-pack cellulose with the typical netting used for this application. The insulation contractor also is the drywall installer. 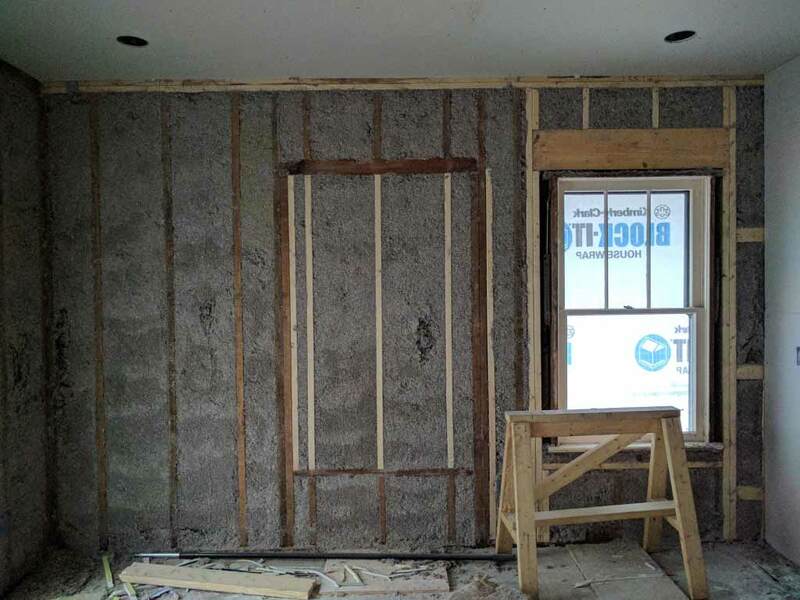 Because of this, we were able to seamlessly insulate and drywall, pre-installing drywall at ceilings to hold the dense-pack cellulose in-place (instead of netting). Here we have installed the ceiling drywall and then blow cellulose insulation into ceiling rafter cavities. 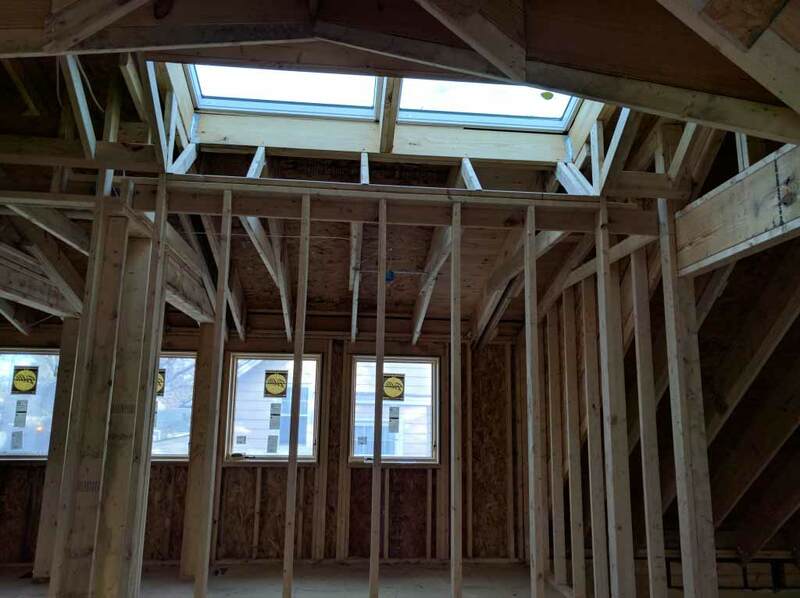 Besides framing, the drywall stage is perhaps the most revealing step of the construction process. In this step, the walls of the rooms become tangible and visually solid. The light levels reveal close to finished state. As seen below, the light becomes softer as it reflects from the paper skinned rooms (weather barrier still covering windows, so some light filtered/dampened). In the rough framing stage, the house begins to show its size but still feels quite open. 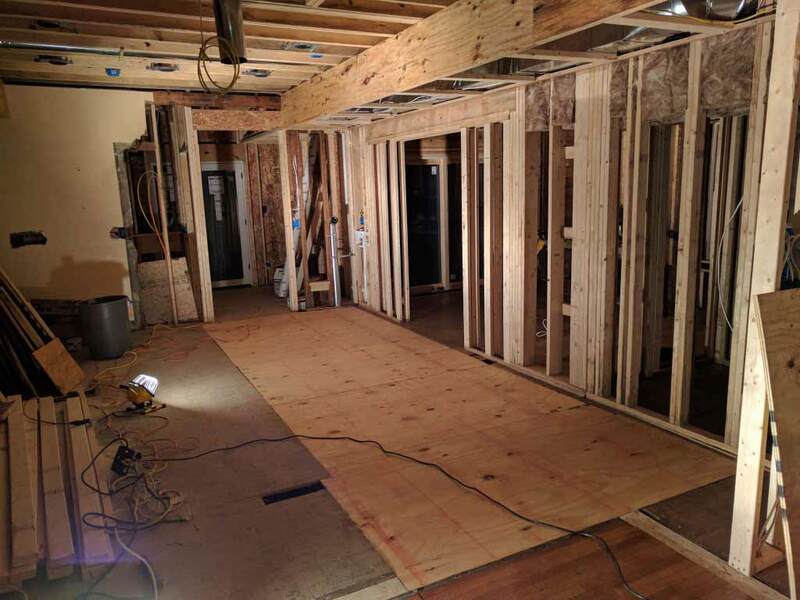 In the drywall stage, the house begins to close in as it defines the rooms. 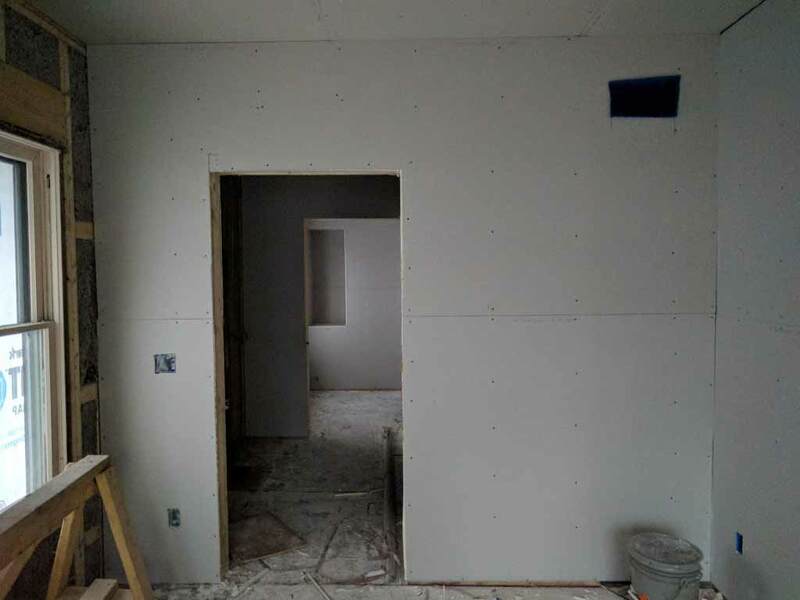 The finishing of drywall brings the experience to the next level as all the edges and joints become white. 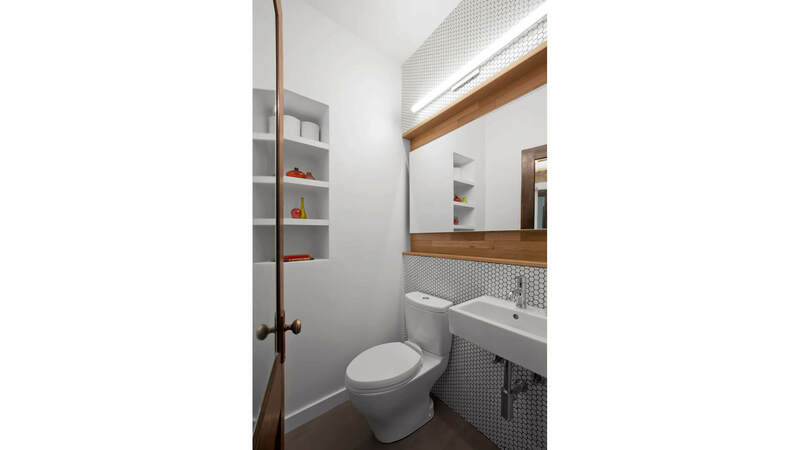 Seen below, the lighting quality becomes softer and the interior spaces begin to glow. The following images are some shots taking during the exterior and interior finishing processes. The image below shows the chimney upward extension from original to new to maintain required clearances from the raised roof structure. The mason had proceeded with the work without our knowledge or acknowledgement of our details. As a result, we weren’t satisfied with the brick match or details, and decided to take it down and redo to our specifications. Here below, we used treated furring to achieve rainscreen cladding for the entire house. When water penetrates joints in the siding, it can drain freely through insect screens behind trims at bottom of wall. For this house, the wide roof overhangs also protect the walls from weather. Primary roofs have wider overhangs than smaller scale dormers as one can see below. 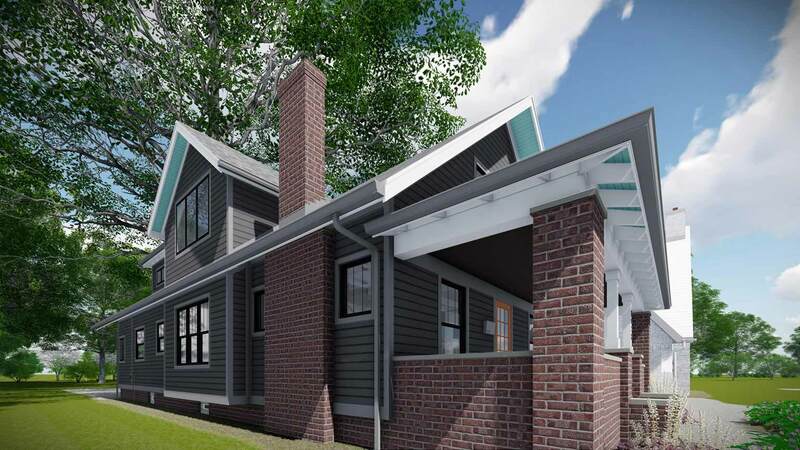 The wide roof overhangs with exposed rafter tails are a fun Craftsman detail that is relevant to many historic architectural styles. 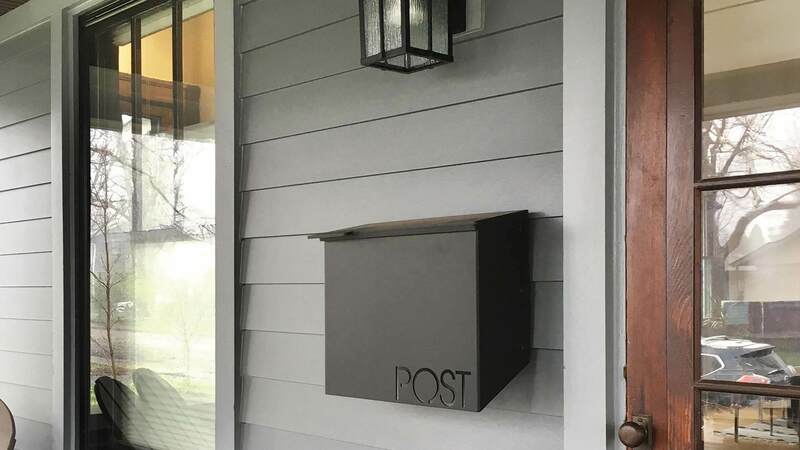 In fact, since “boxed eaves” still predominate the building industry (perhaps because they are cheaper, easier to build, and probably easier to maintain), these exposed eaves and rafter tails help differentiate an architecture that has been designed and executed thoughtfully, vs. more generic approach. It also possesses a certain nostalgia and charm. Here below we are beginning to build the back deck structure. 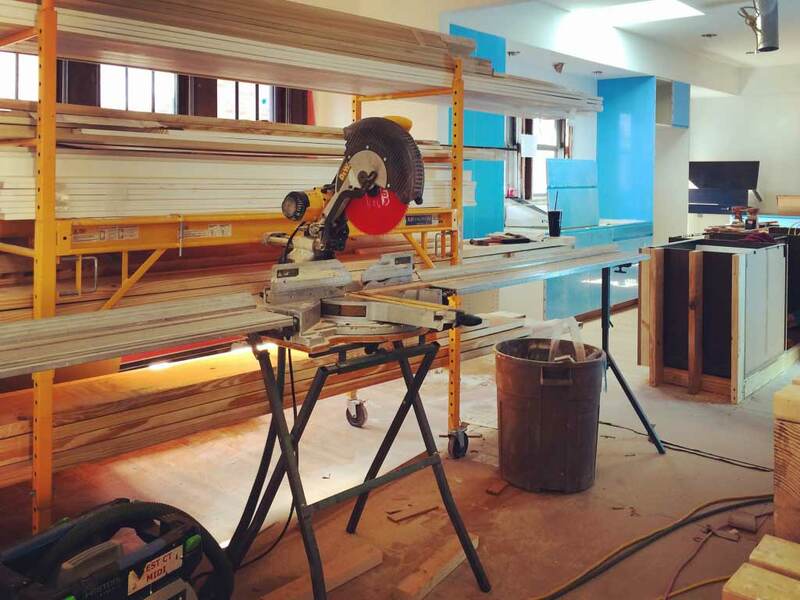 Meanwhile, trim carpenters have begun to take-over the interior spaces. 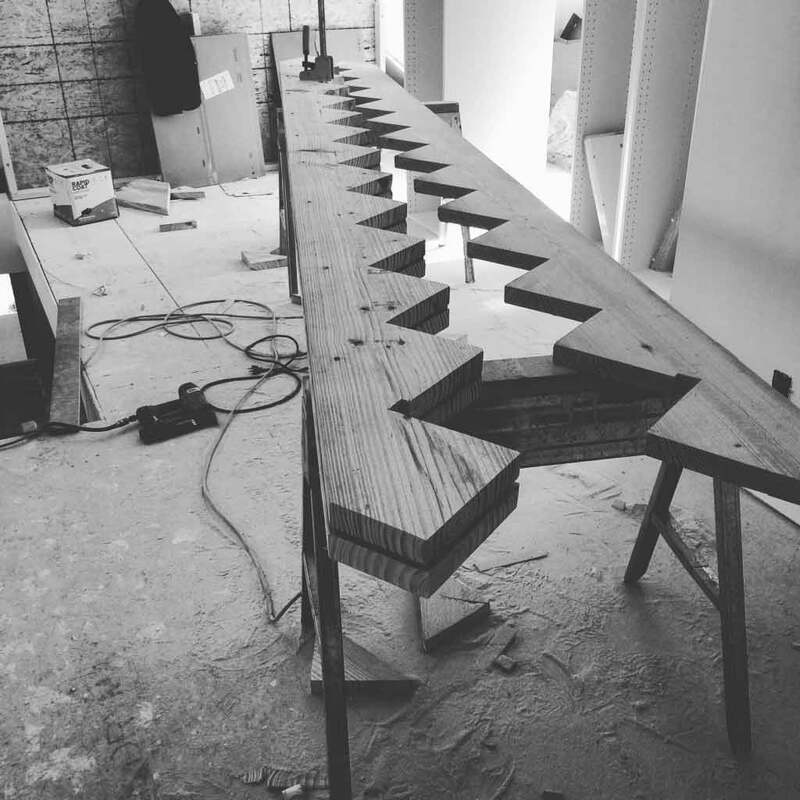 We are fabricating a few custom pieces for the inside that will remain exposed. We noted earlier how we wanted to pay special attention to the stair stringers since they would be exposed. 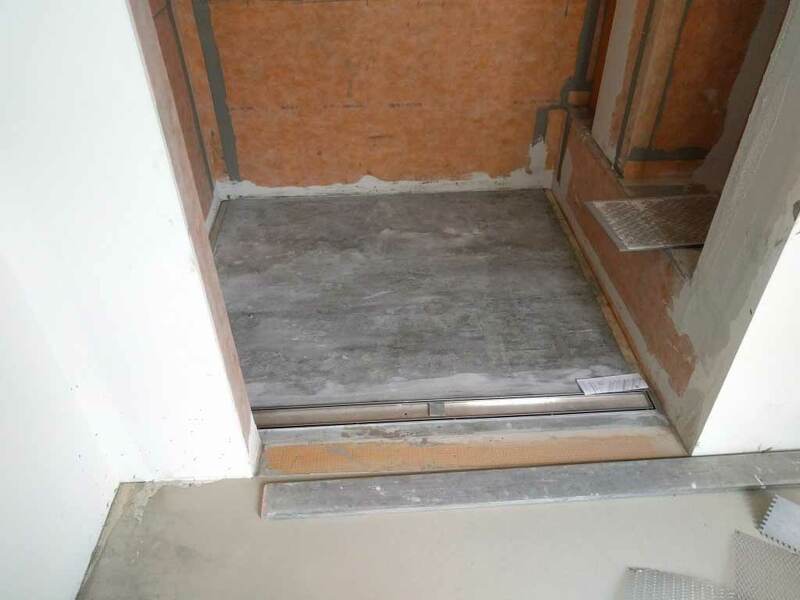 Rough carpenters were able to achieve a stair that was useful for loft access. However, we needed to make some adjustments later to capture the details, some of which we designed later in the process. 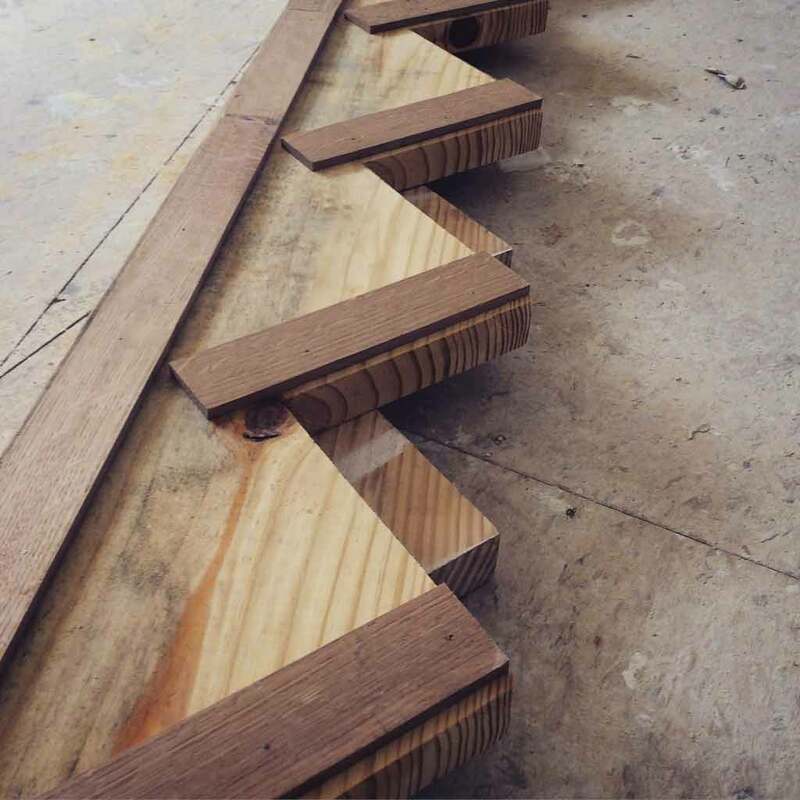 So we worked with the trim carpenters to remove and re-fashion the stingers to achieve the refined vision. The second photo below shows how we reused scrap oak finish flooring to create spacers between doubled-up rafters. 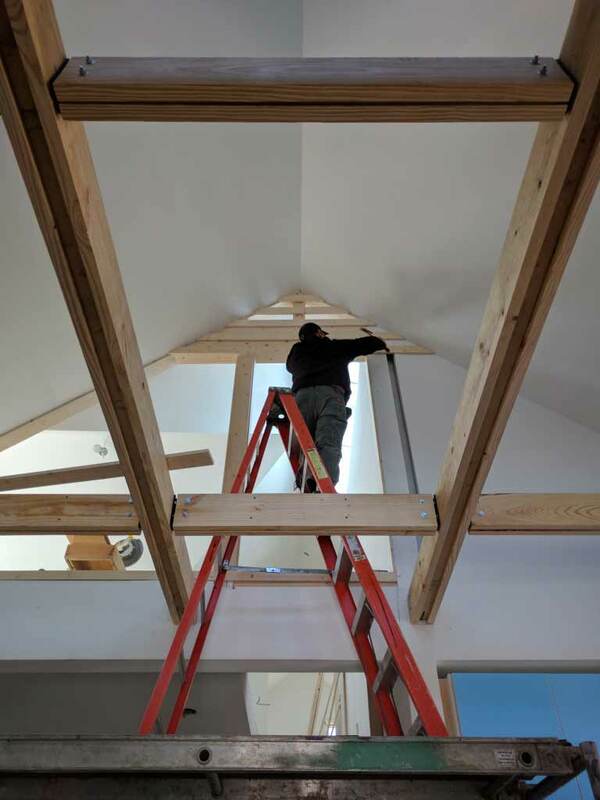 Regarding the rafters, we doubled them up to create the stiffness necessary for the vertical cable-rail system. 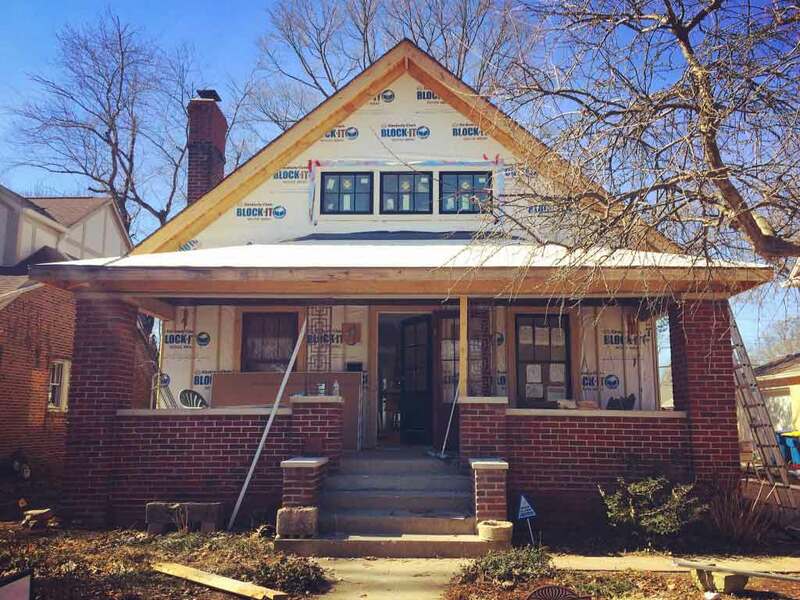 As Winter grinds on, so does the progress on the Broad Ripple Modern Craftsman Renovation. 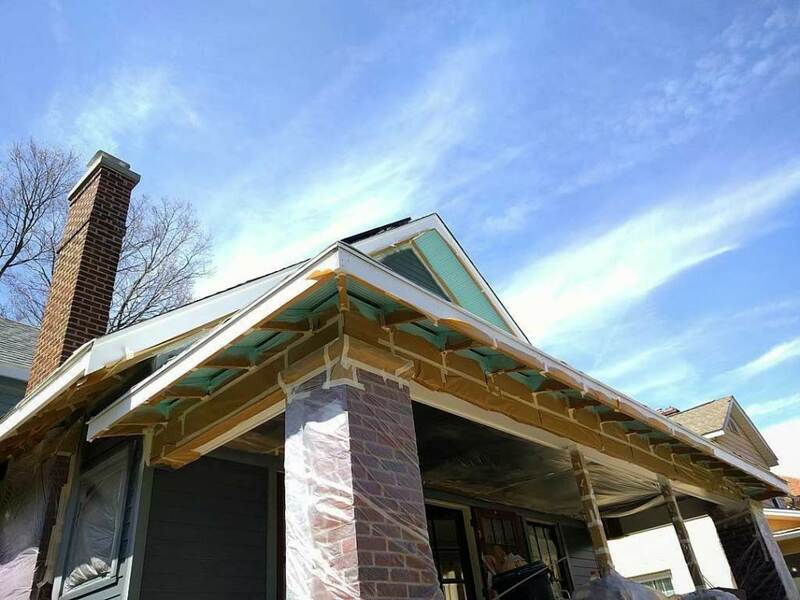 We had exceptional weather for February and that meant the exterior work could move along sooner than anticipated. The interior trim carpentry also took off. 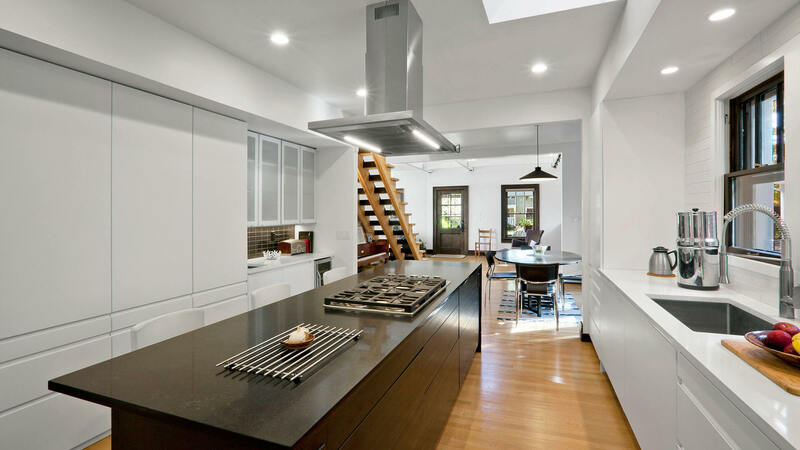 Indeed , we shared our clients’ excitement as we watched the cabinetry and trim installations. This is the stage in which the true craftsmen show their skills. Most historic structures (including this one) require extra skill and effort to achieve precision. This is because most older structures aren’t plumb. Foundations settle and wood structures expand and contract over time. 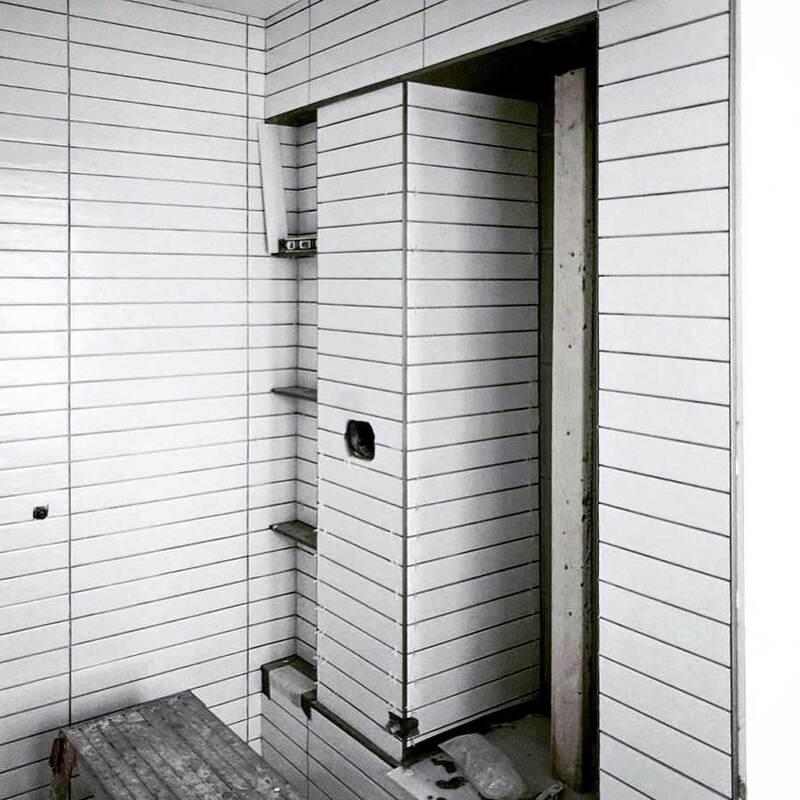 Here below, the Master shower details are coming together, including the trench drain installation. 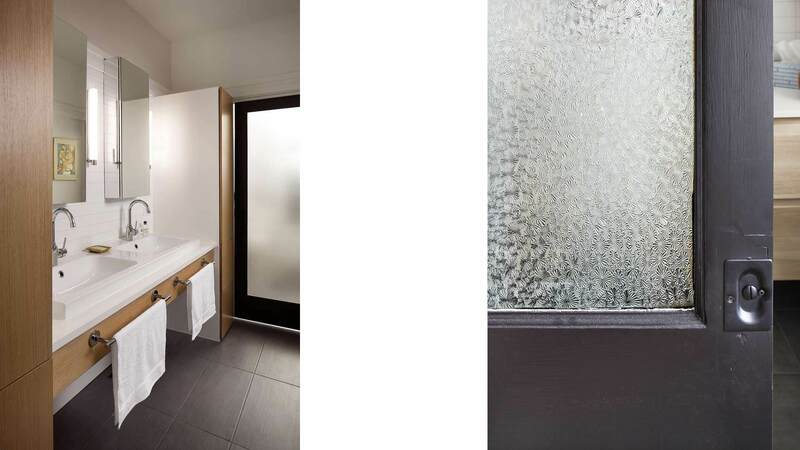 All parties put a lot of effort into achieving the master shower precision. 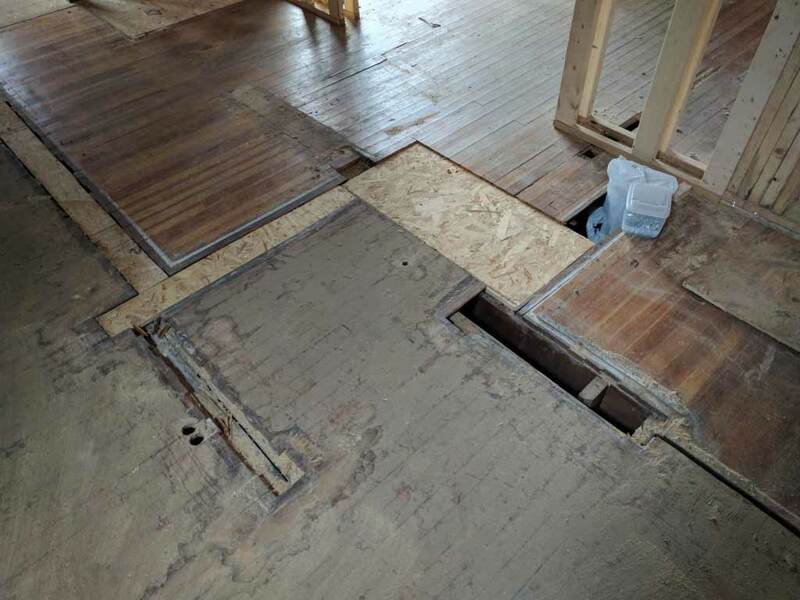 It’s not easy in a historic home, as the floor was not really close to plumb. For that reason, tile contractor had to level the area with mortar to achieve plumb in the shower. As one can see, the stacked-bond tile pattern pretty much has to be perfect or it doesn’t work. 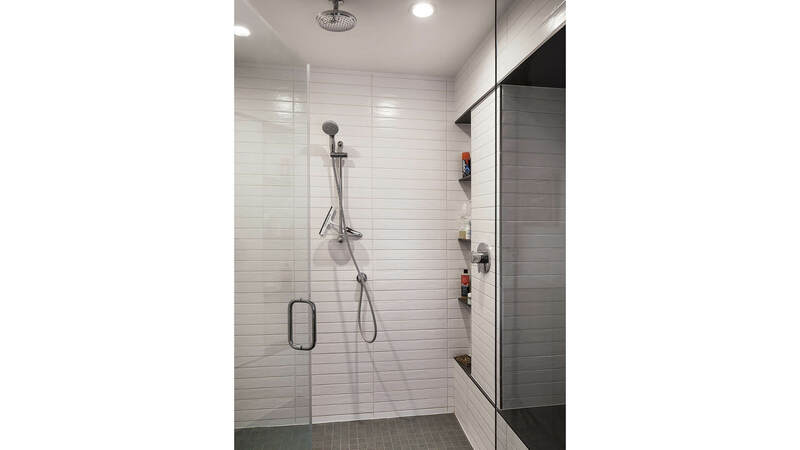 We had some fun with this shower design, and the tile contractor pulled it off. Our trim carpenters are excellent. Here, they are fine-tuning one of the pocket doors. Beyond the initial attempt at a chimney cap, we learned that the existing chimney needed some repair. 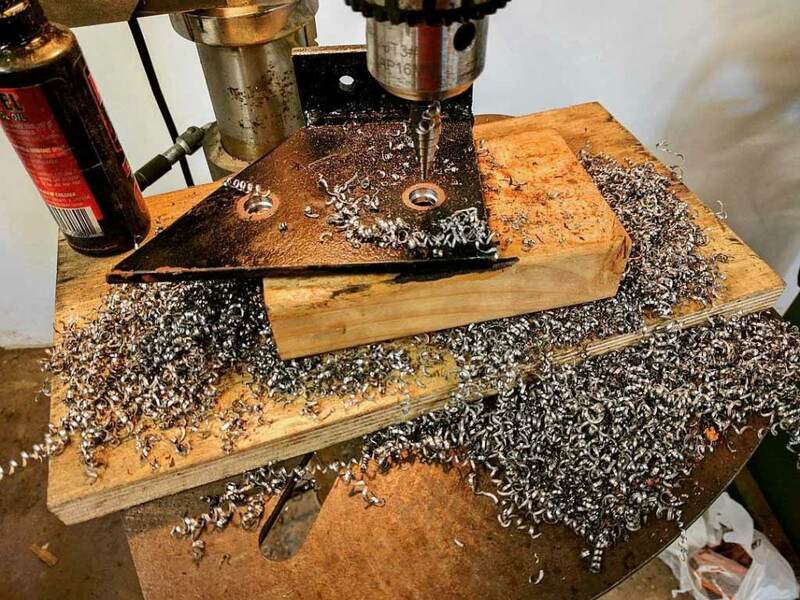 It had been functioning without a liner for many years! We are inserting a stainless steel liner and installing a new chimney cap (again). 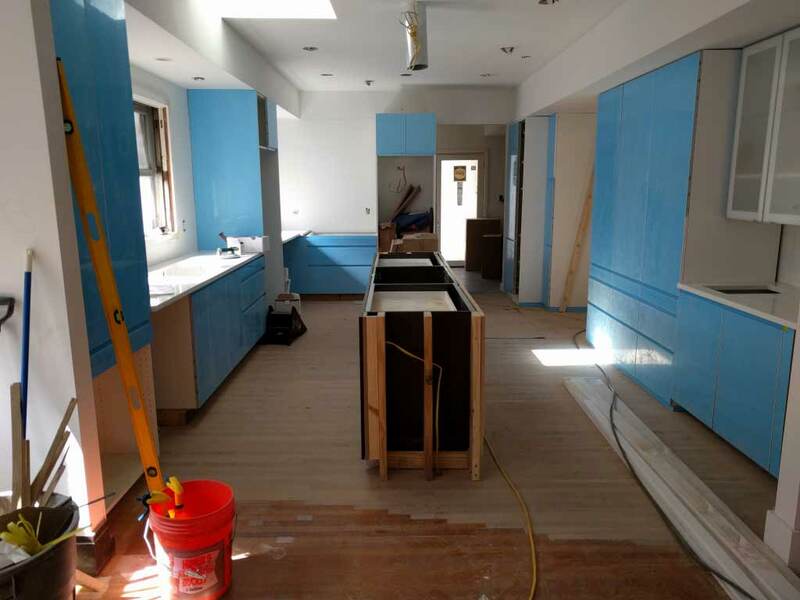 As we began countertop installation, it was great to see the quality of the light in the space. We have transformed the living room space with sloped ceilings, and beams. Exposed beams will anchor up and down lighting. Also, slat wall installation is underway. 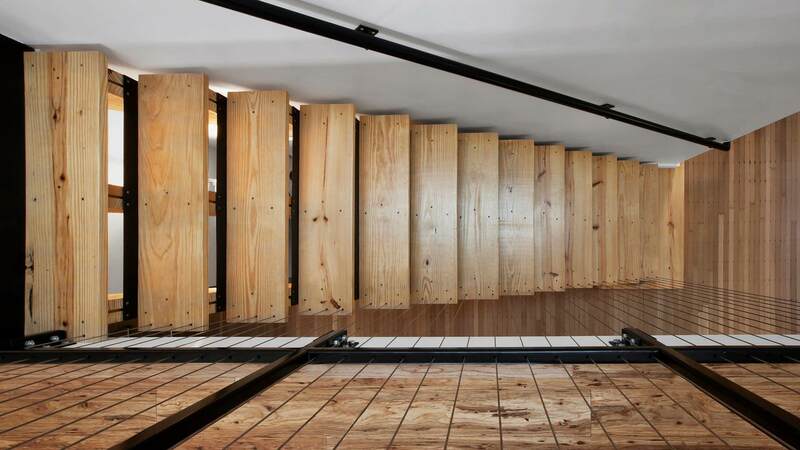 Slat wall will define loft space while sill allowing views and lighting to flow. Below, we can see that exterior painting is underway. 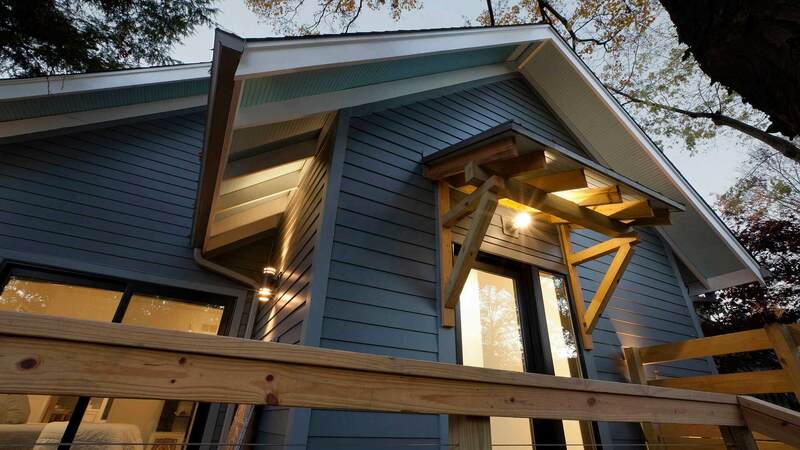 We spent a lot of time refining the exposed eaves and rafter tails, and decided to highlight them with a light blue paint. This requires extra effort to mask each rafter, but it’s well-worth the effort for those that care about design quality. Just look at the wonderful details on many historic homes. Here we can also see the refinement to the chimney cap. The “new” mason gave us a really nice brick match and agreed precast chimney cap for a nice look and durability. There are a few design enhancements that will be included in future phases, so please check back for updates to the story! Appreciate the way you have documented the progress of this project. It has been a blessing to come to know the owners of this house and am so thankful for the blessing you are making for them. Thanks for your thoughtful comments. We are having a lot of fun on this project! 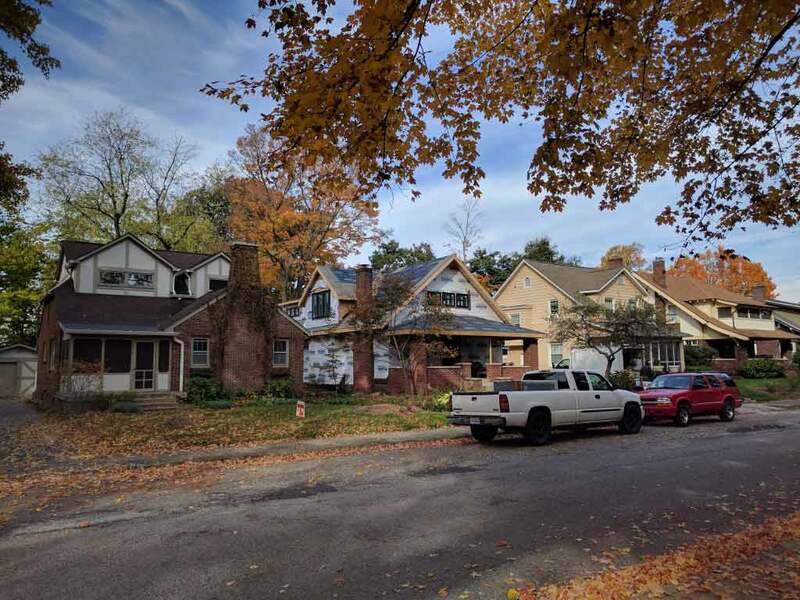 The homeowners are a joy and their enthusiasm is contagious – looking forward to the details coming to fruition! Wow! I am so impressed. But, I’m Chris’ mom.